Saturday Last morning in Hiroshima packed things and headed out. 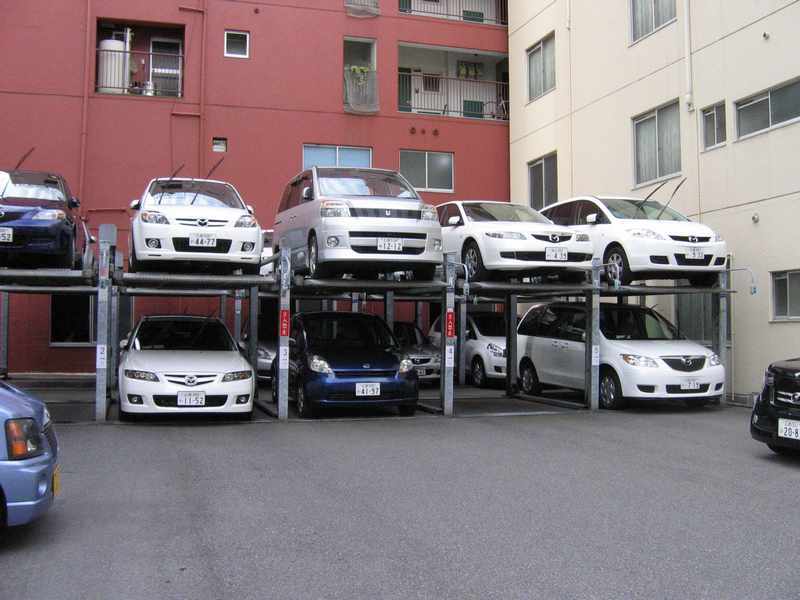 Just near our Ryokan was this interesting solution to Japan's ever-present parking problem. 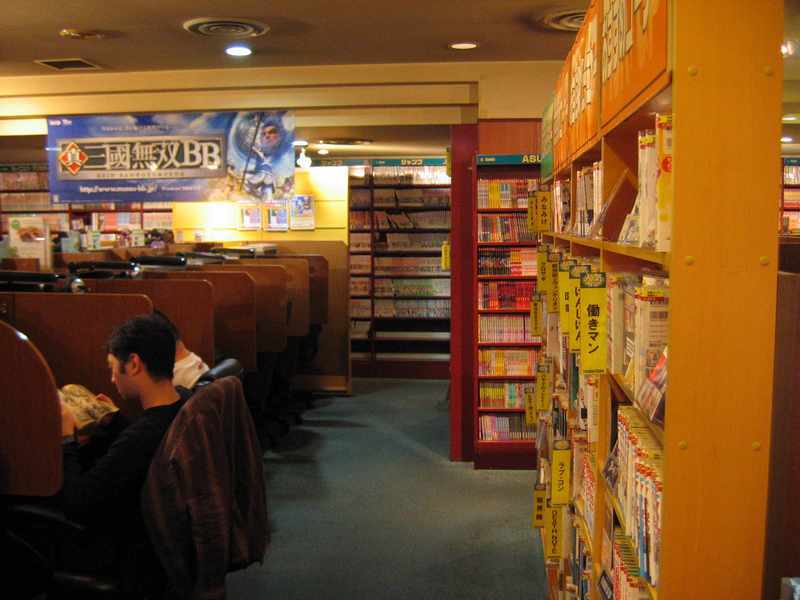 We went to an Internet cafe near the train station to check up on things. It was again very cheap at 409 Yen for 1 hour and, like the previous place, all you could drink and all you could passively smoke. It was a fascinating place. 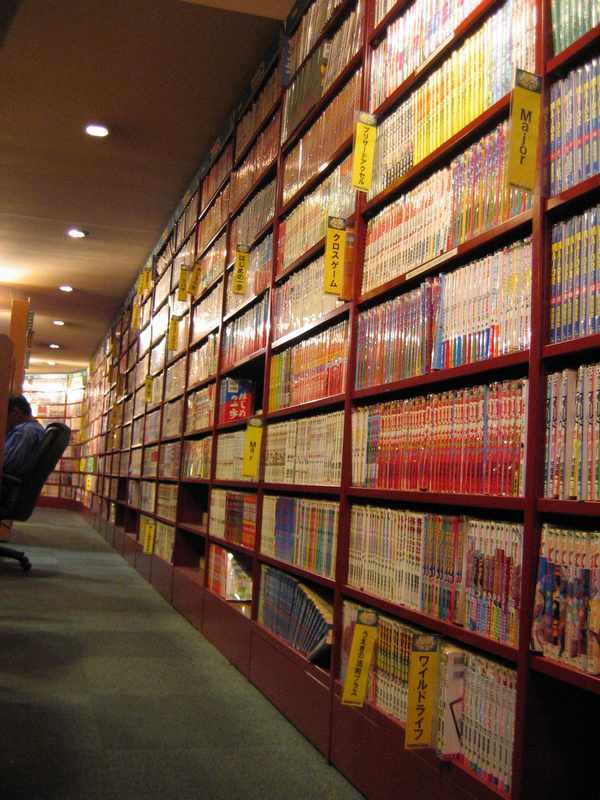 Clearly some had spent the night there, playing on-line games, reading Manga or watching Anime. 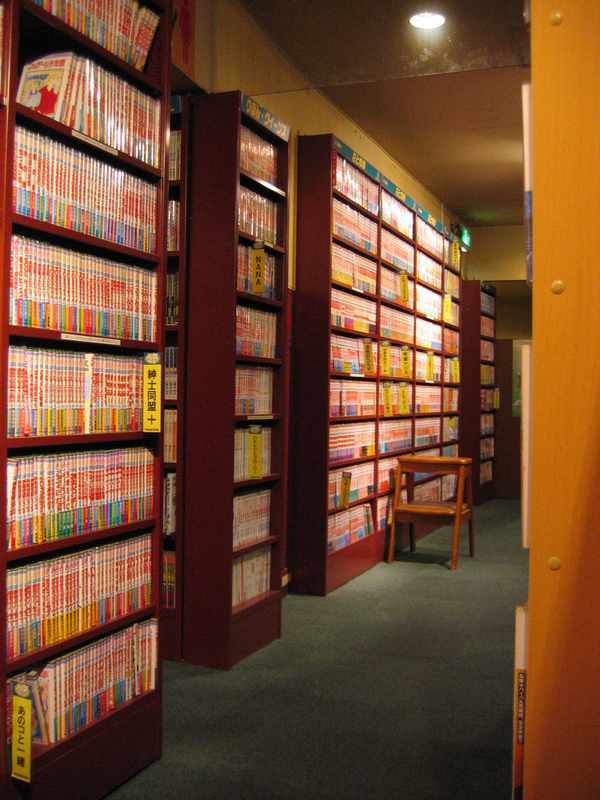 The Manga collection was not as extensive as the previous Internet cafe and the staff weren't quite as friendly - they exiled Gail from the place because they only allowed 1 person per terminal. We'd really enjoyed our time in Hiroshima. It had a feel that wasn't entirely dissimilar to Adelaide, having a more relaxed lifestyle than the business chaos of Osaka or the utter madness of Tokyo. We took the Shinkansen back to Osaka and then a second train back to Kyoto, back to the Yuhara Ryokan that we stayed at previously. We caught the subway into down town Kyoto for dinner at a Yakitori restaurant. This was basically a restaurant that served up all kinds of meat and vegetable skewers. The menu consisted of a whole range of things that I wasn't used to eating so we picked a few things that we felt comfortable and randomly picked a few others for good measure. It was a great cheap feed. 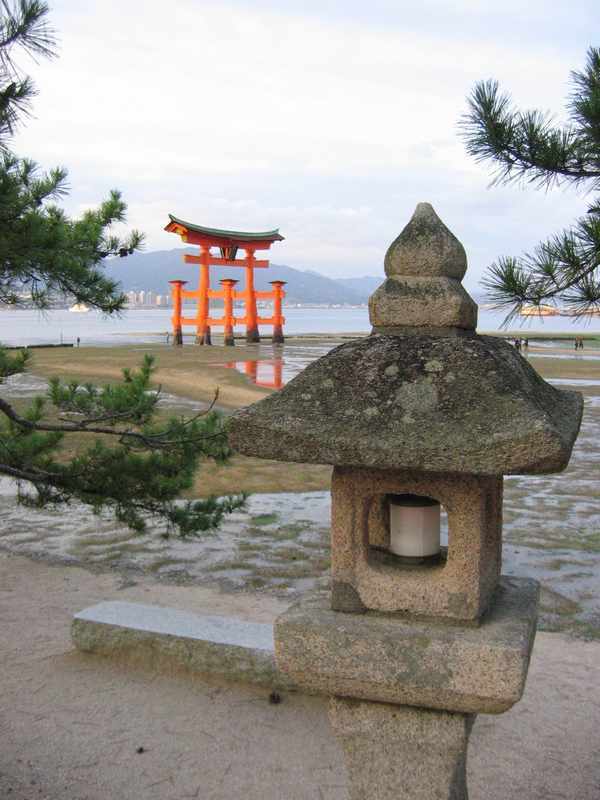 We finished our tour of Mazda and took the train back to the JR Hirosima main station we then took the San-yo line down to Miyajima to take in what is regarded as one of the best 3 views in Japan, the floating Torri. From the Miyajima station we walked down to the waterfront and took the ferry across to Itsuku-shima island, enjoying the clear afternoon sunshine as we went. Once we arrived on the island there were these couple of guys who were obviously famous in Japan as people were looking, pointing, giggling and taking photos whilst these guys walked along being filmed. 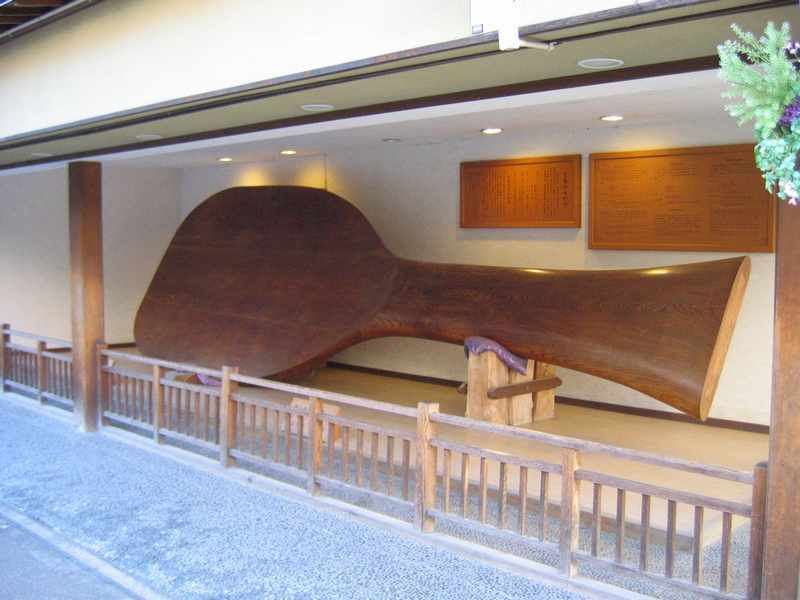 The town itself had a few interesting points, notably the worlds largest rice scoop. The town was overly touristy and tourists was something the town didn't lack. We weren't here to check out nick-knacks or overpriced bits of wood so none of that mattered. We did however treat ourselves to a tasty ice cream. We also purchased some Japanese Stamps from a very helpful post office assistant to give to a stamp collecting grandma of ours. 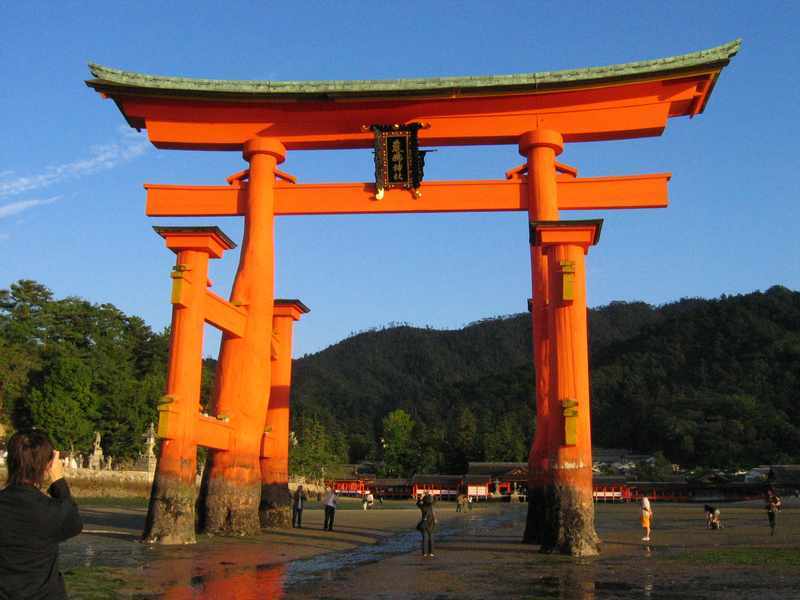 The floating torii forms a huge water gate for the approach to the shrine on the island. 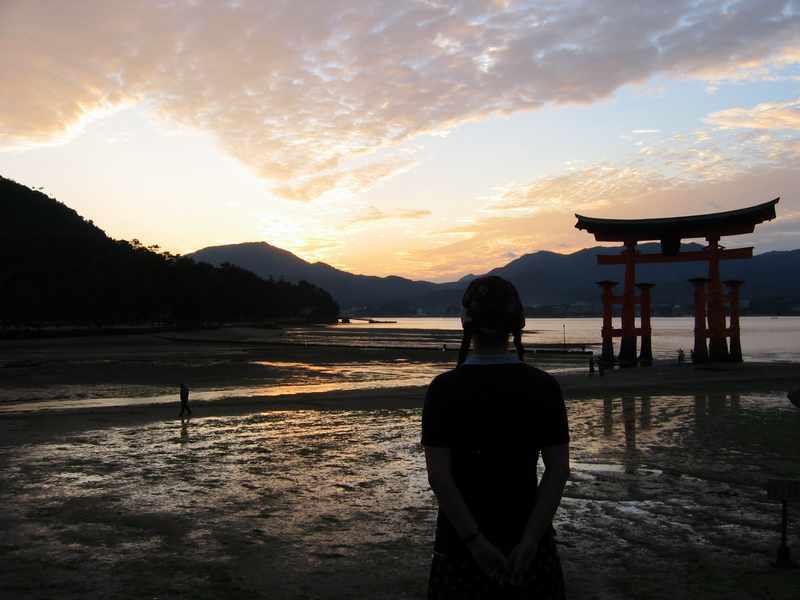 Commoners were not allowed to set foot on the island and had to approach the shrine by boat, entering through the floating torii in the bay. The image that is immortalised in all the travel brochures requires a high tide. 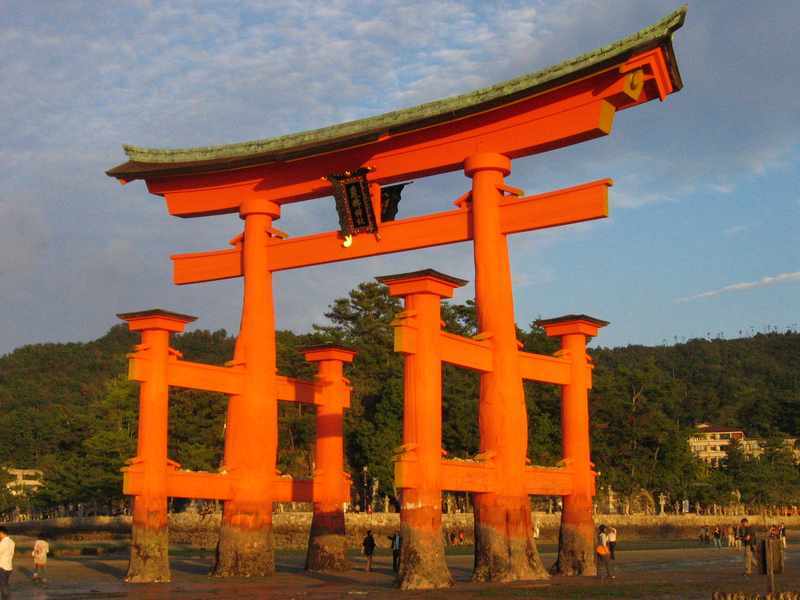 The size of the torii was most impressive. The main uprights were made of rough-cut tree trunks and the remainder of the structure was made from dressed wood. 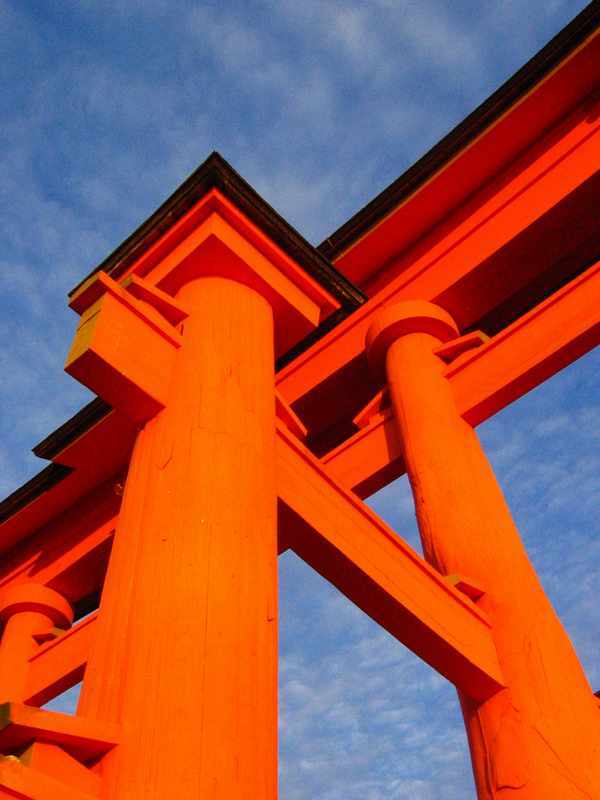 The whole structure glowed in a vivid orange as the sun lowered in the sky. Traditional Japanese wood wedges are used to lock everything together. Our delay due to visiting the Mazda museum earlier in the day meant that we were at the floating torii late in the day. We waited until sunset to get some good shots. While waiting for the sun to go down we had great fun running around on the firm sand and clay, playing with tiny crabs that scavenged in the shallow puddles, splashing in the shallows and taking plenty of photos. After sunset we made our way back to the mainland and the JR train back to Hiroshima. We walked to a main shopping arcade to an Italian restaurant and had ourselves quite a feast. We made it back to our Ryokan, full of good times and good memories. 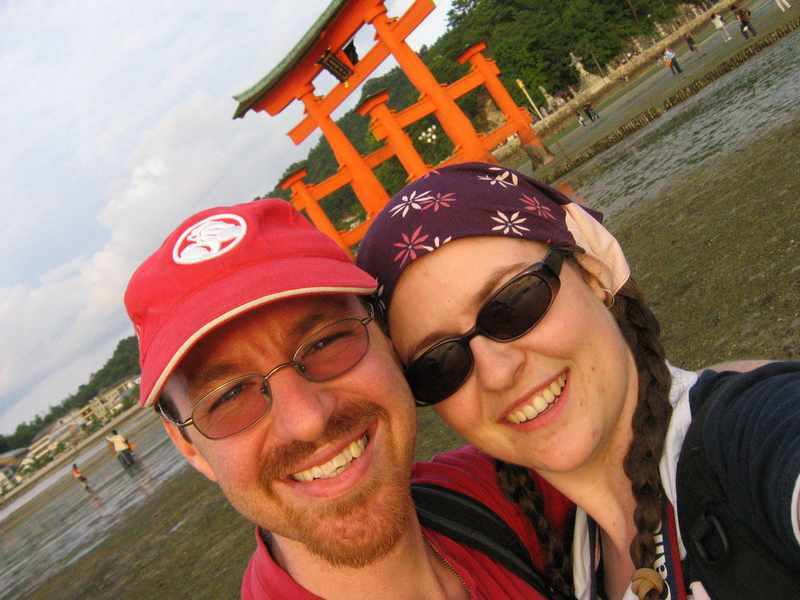 The plan for our last full day in Hiroshima was to go to the Mazda museum in the morning and then go to the floating torii in the afternoon. 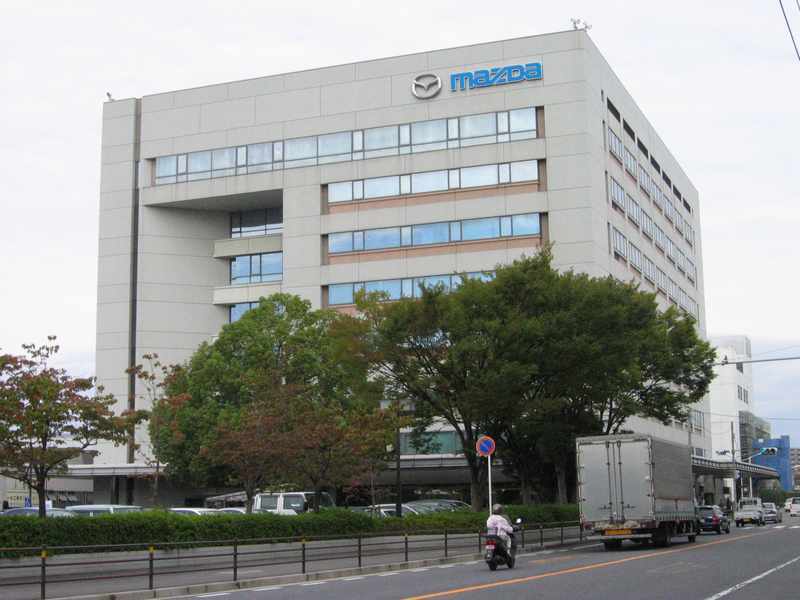 We walked to the train station and took a train out to the Mazda factory. When we arrived we learned that there are only 2 tours per day, the first at 9:30 and the second at 1pm. We'd just missed the morning session and the afternoon session was the English one anyway. We took the train back to the station and caught a street car to where we could walk to Carp Castle, also known as Hiroshima-jo. 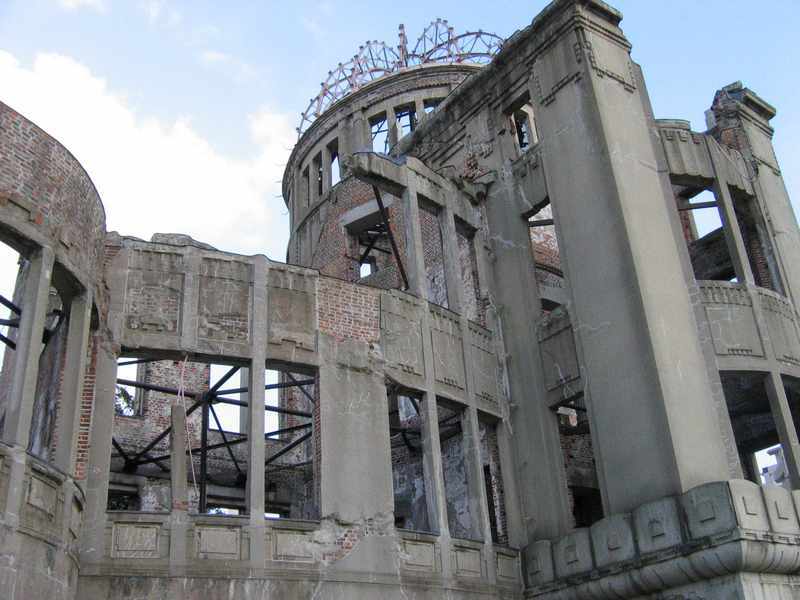 It was originally built in 1589, was partially dismantled and the A-bomb wiped the rest out. 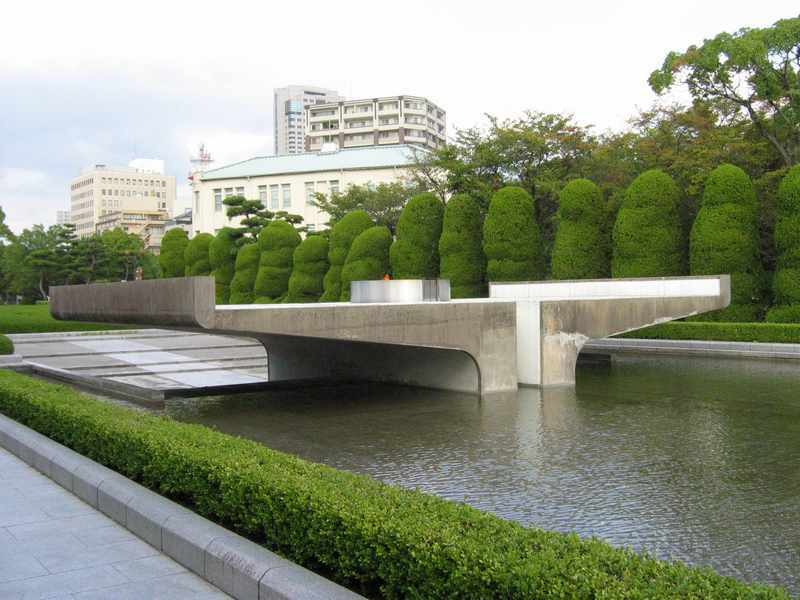 A ferro-concrete re-creation has since been built. The grounds were originally very large with 3 encircling moats. These grounds have steadily been encroached upon by the growing city and now only the innermost moat remains. 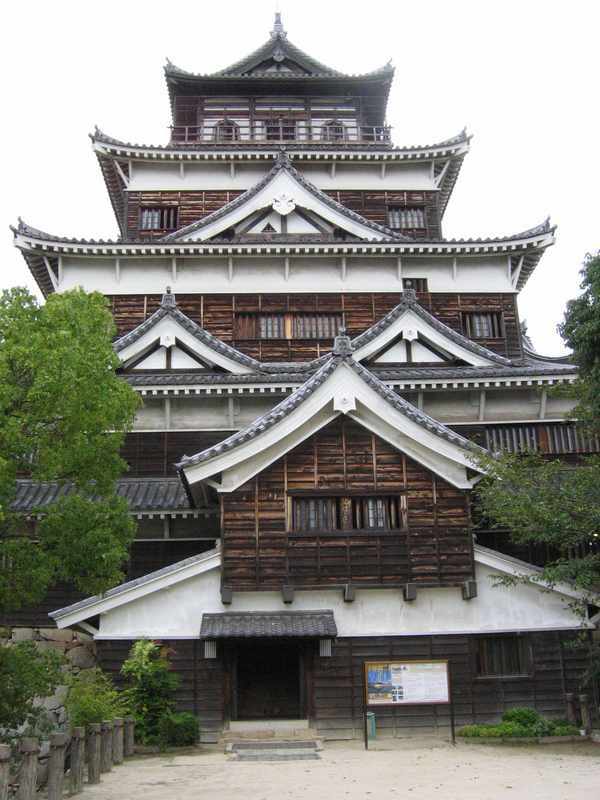 The 5-storey Carp Castle housed a range of artefacts of the region, particularly relating to the Samurai. On display were costumes, some very fancy swords and knives, re-created living environments, warriors clothing and the history of the castle. We took the street car and train back out to the Mukainada station and the Mazda factory again. Lunch was sandwiches whilst sitting on a bench in the train station. 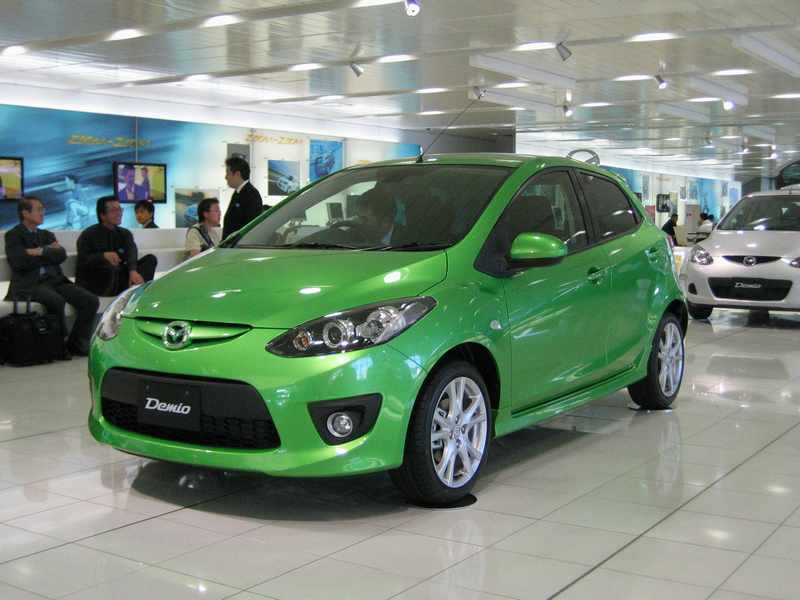 Arriving at Mazda brought us into a showroom with the newest of Mazda's car's on display, the Mazda2. From here we were all given strict instructions about the use of cameras as we were ferried through the plant in a bus. Trucks, vans, cars and cars in camouflage zipped around us as we went. The site itself was very interesting. Part of the port is owned by Mazda and they've even built their own 500m long bridge over it. The plant was laid out linearly, with metal stamping at one end and cars rolling out the other, after going through 4 plants. The distance from the end of the plant to the waiting ships was about 100m. 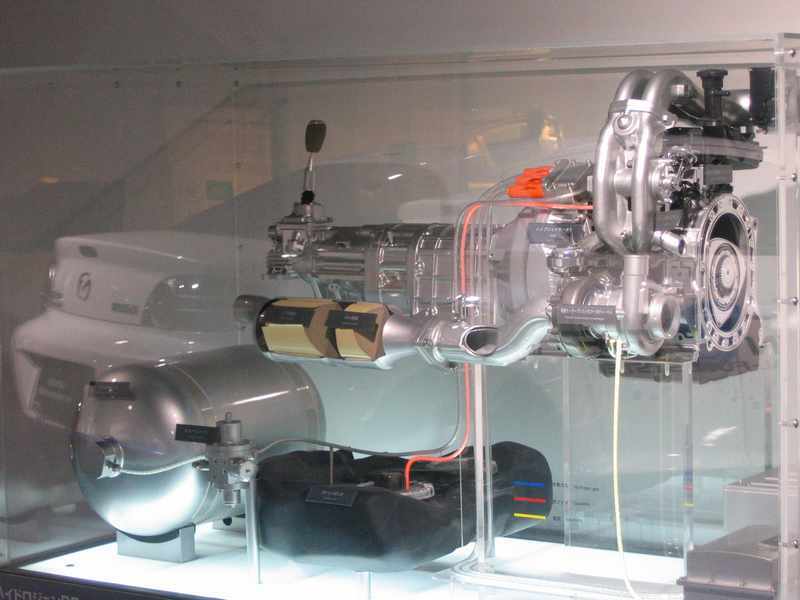 There were even Mazda schools and their own power sub station. Talk about optimised. The museum was set adjacent the main finished assembly factory building. 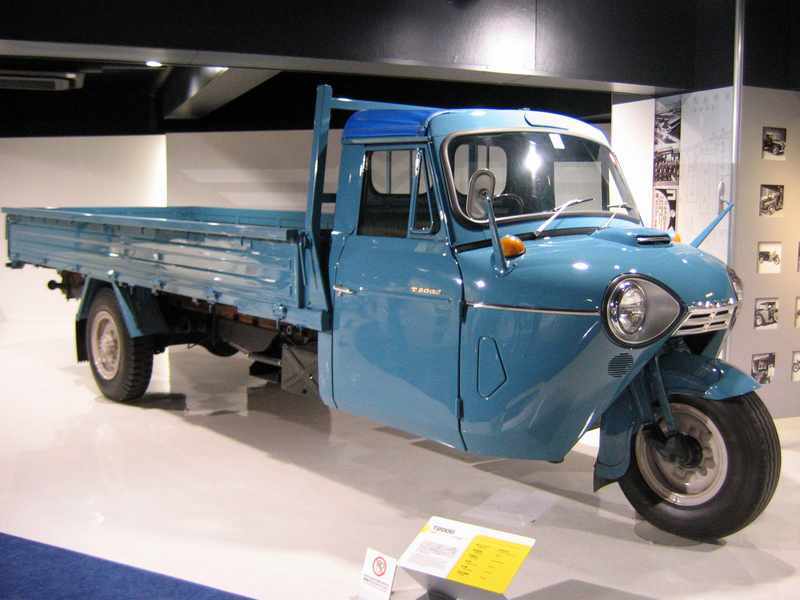 Mazda started out in 1920 building trucks and, 11 years later, motorbikes. 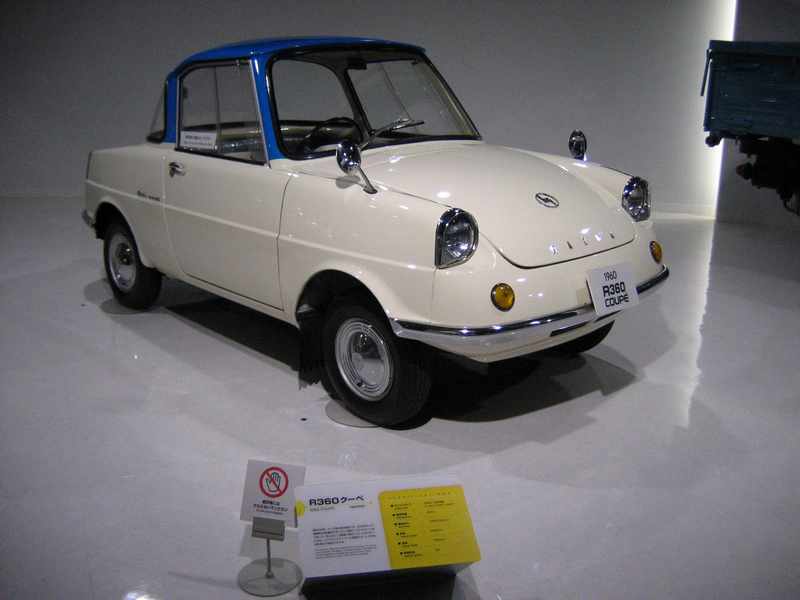 It built it's first passenger car in 1960. 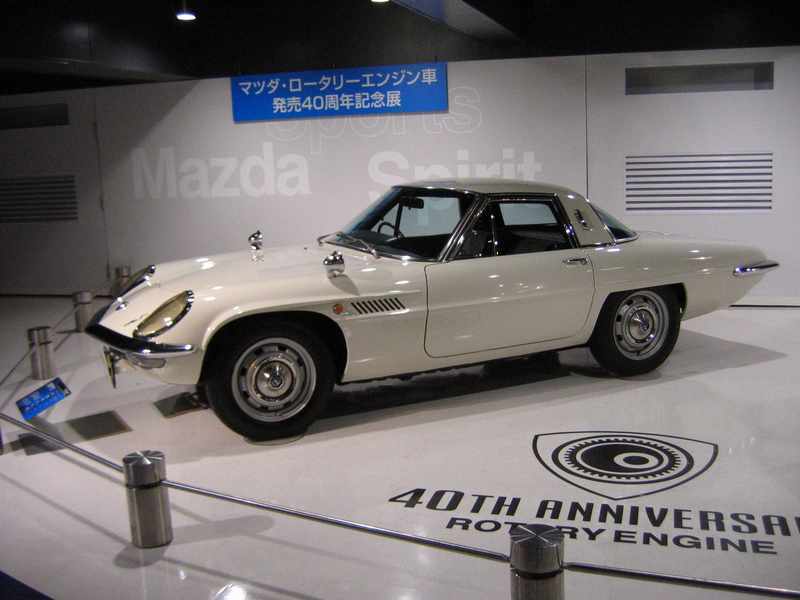 The museum housed some absolutely mint condition examples of all the major Mazda models, including a 1960 R360 coupe, a very rare (because it was rubbish) 1975 Roadpacer, various Familias, Capellas and Cosmos and one each of the 3 major releases of RX-7. 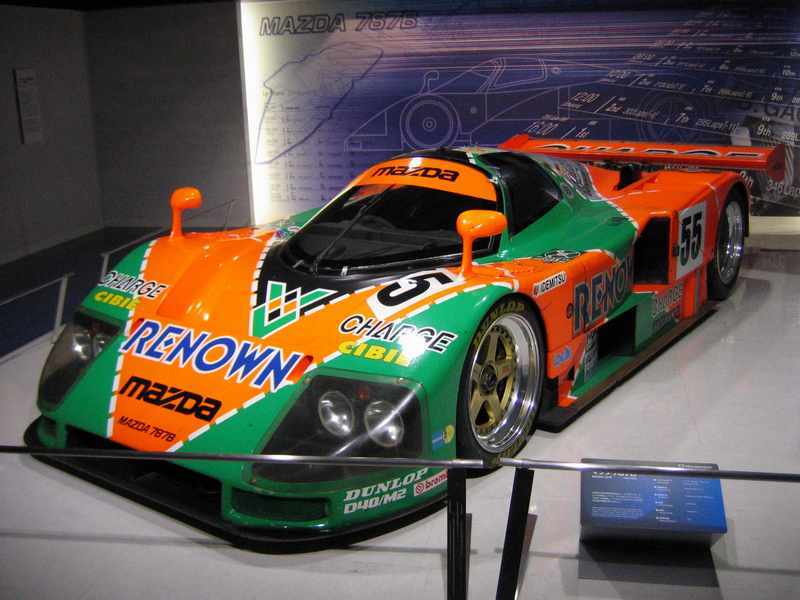 The next area showed the history of the Rotary engine with Mazda, including the car they won the 1991 Le Mans 24 hour race with. 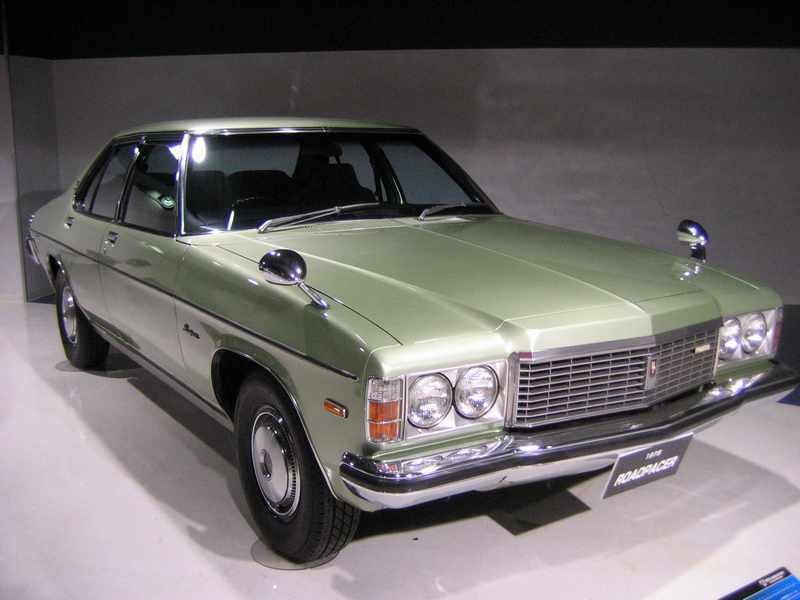 Rotary engines were banned the next year. 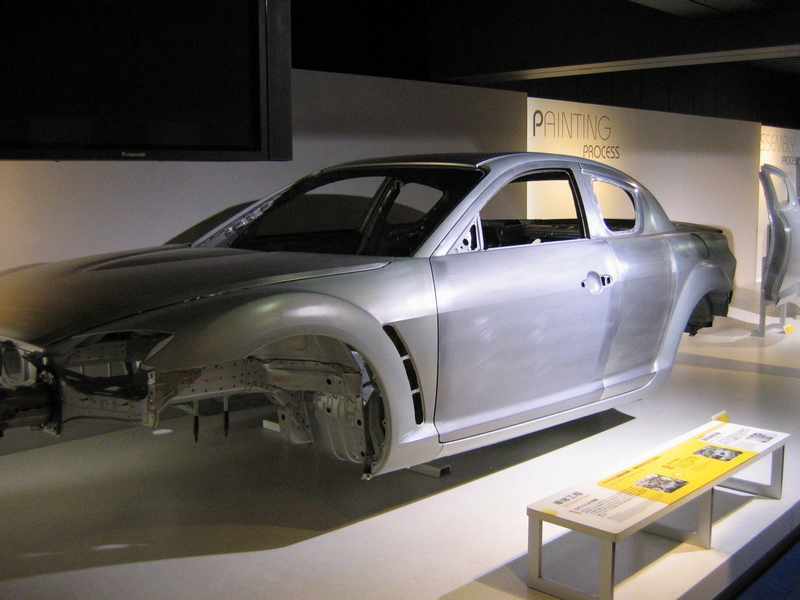 Following on was a technology display that showed things like a car without a body, displays of the thousands of components that go into making a car, displays showing the development process from concept through to clay model, a seating buck and a mock-up, one of the crashed prototype RX8's and the metal fabrication and painting processes. 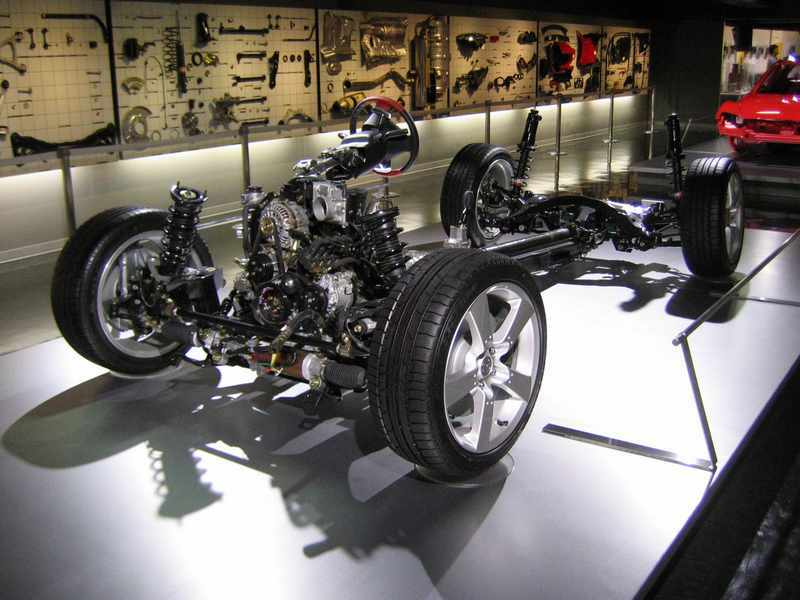 On the other side of a set of double doors was the the finished vehicle assembly line. 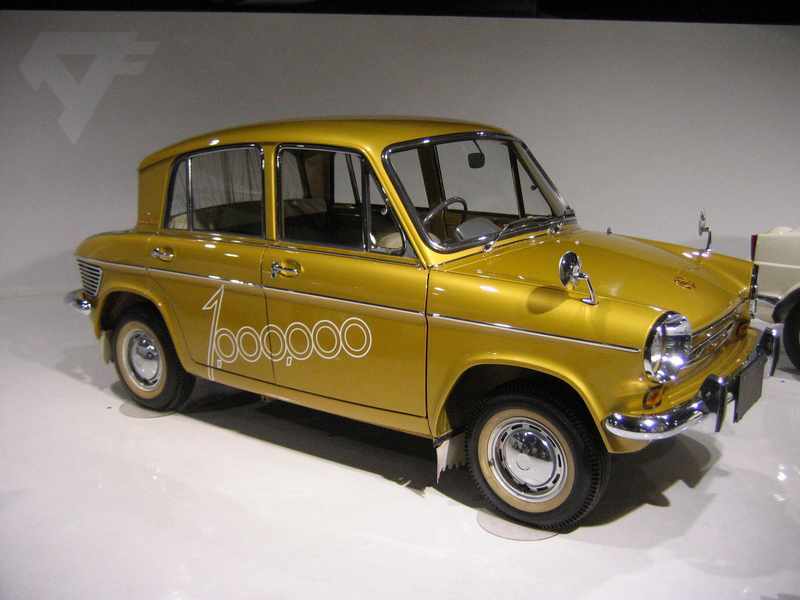 Here they assembled MX-5's, RX-8's, the Mazda2, the Bongo van and a small Japanese domestic-only buzz-box. 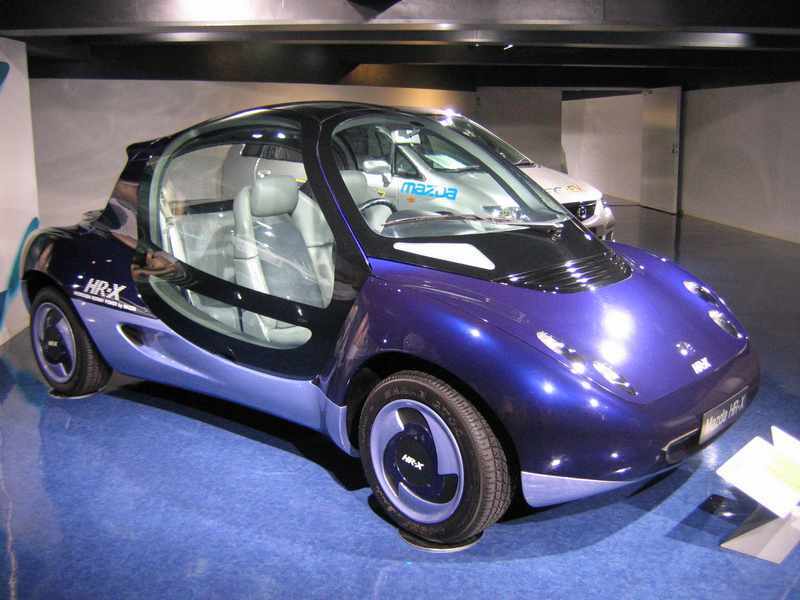 The line hardly stopped whilst workers worked at the speed of utter slaves to assemble the cars. Each person did just a couple of activities on each car, starting at the front and working to the back. 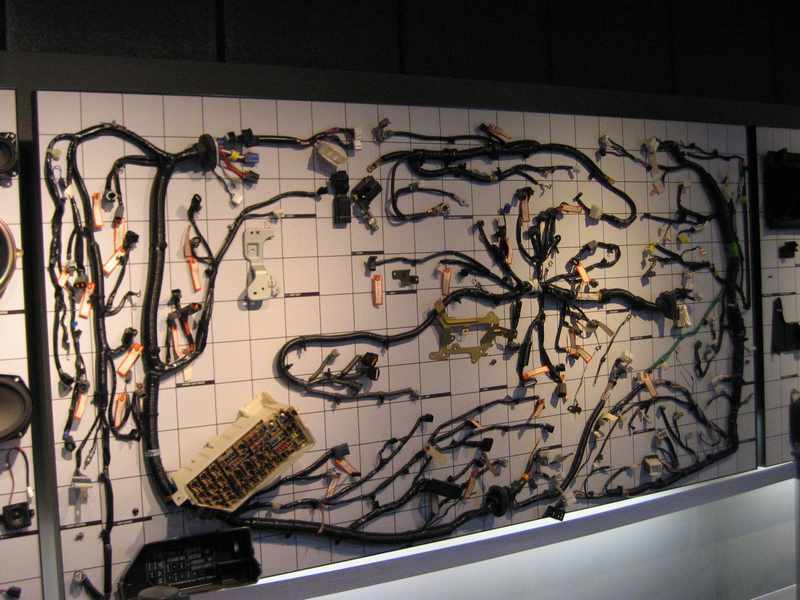 It was the leanest Lean Manufacturing line I'd ever seen, with components coming from above, below or the side just seconds before the workman needed them. 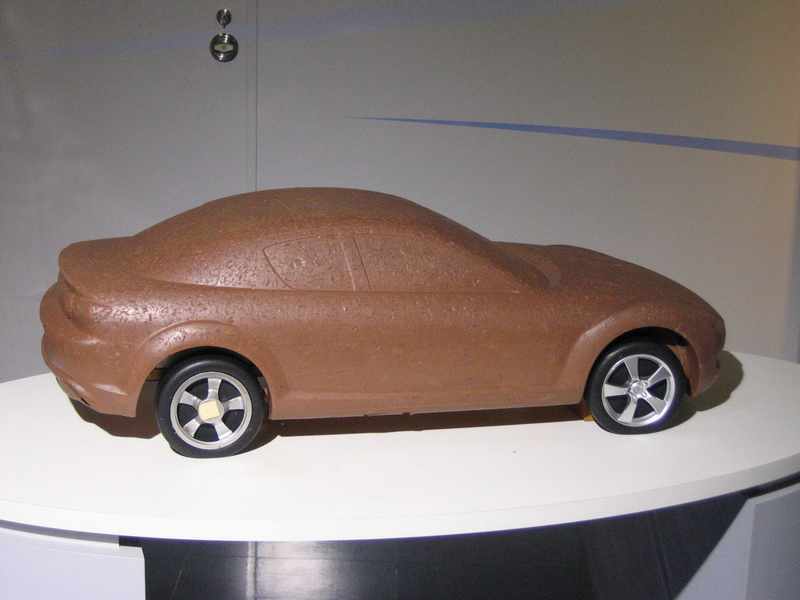 Mental note to self - never take up a job on the Mazda production line. 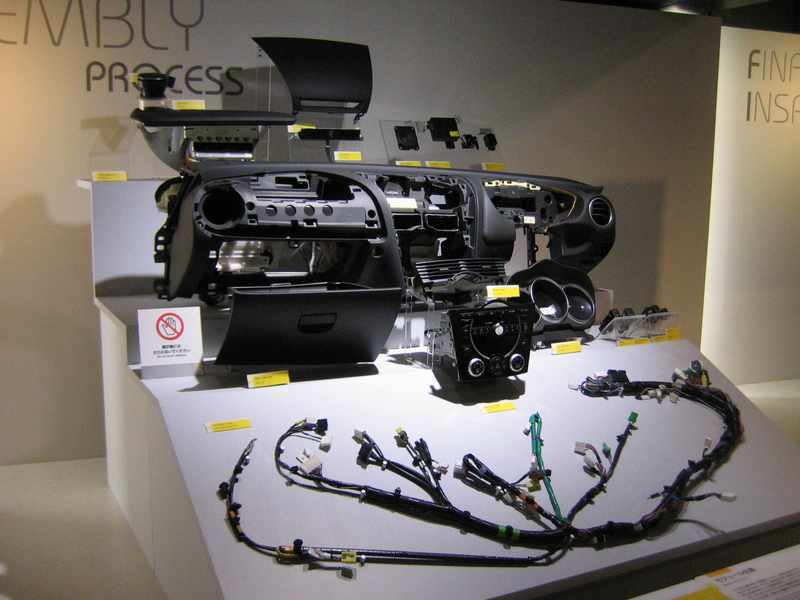 Lastly was a display room with some of Mazda's future vehicles. 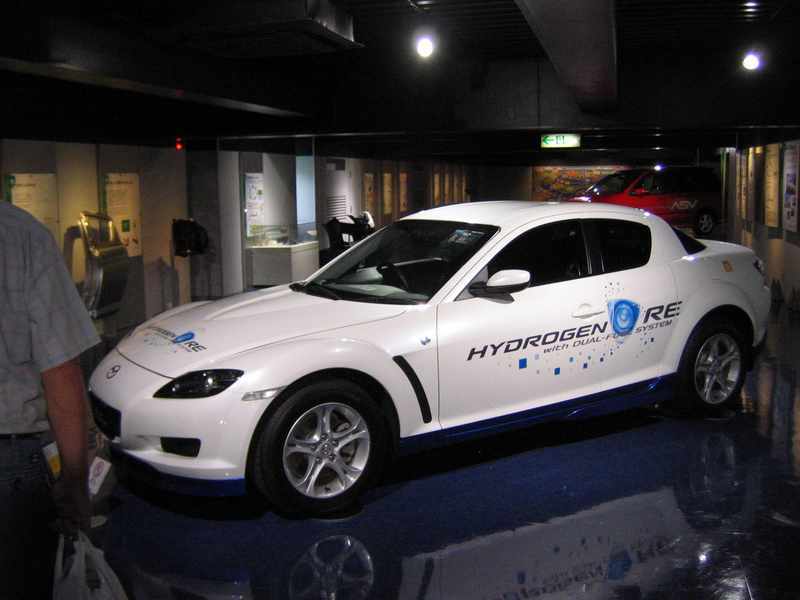 These included one of the Hydrogen-powered RX-8's, a car that can drive itself and a couple of other working concepts. We woke bright and early on Thursday morning, full of beans (figuratively speaking) and ready for our trip down to Hiroshima. 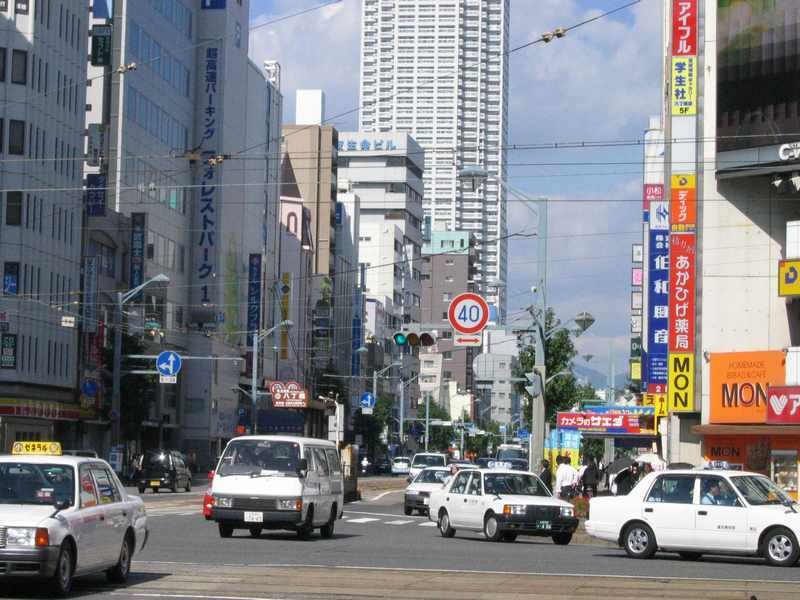 The travelling time on the Shinkansen from Kyoto to Osaka was only 15 minutes. 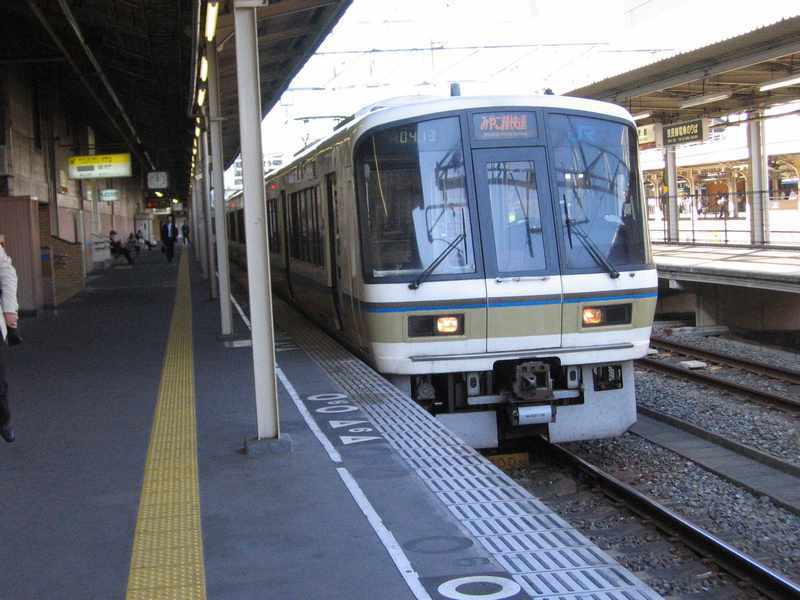 We then changed trains for the 1 1/2 hour Shinkansen ride down to Hiroshima. Like previous Shinkansen trips, it was enjoyable, but with a disproportionate number of mountain tunnels obscuring the view. 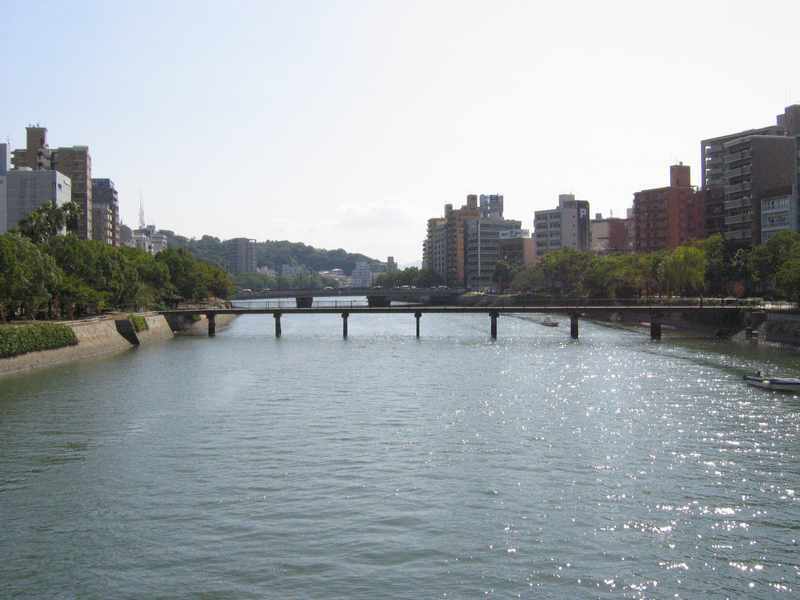 Hiroshima is fairly low lying, flat and sandy. As such there's no subway system, rather a few tram lines for getting between the major landmarks in the city. 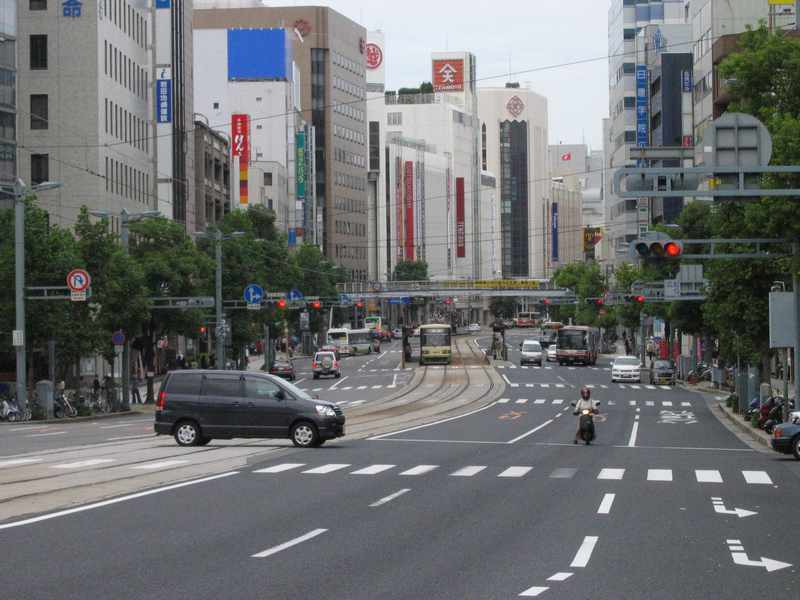 The trams complement the City of Peace allusion. 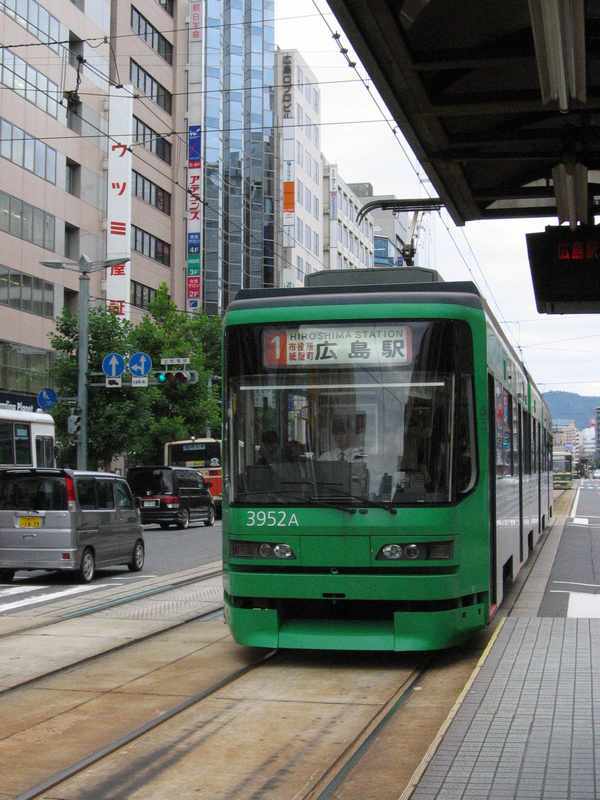 To get to our Mikawa Ryokan was just 3 stops on the tram from the main JR train station. 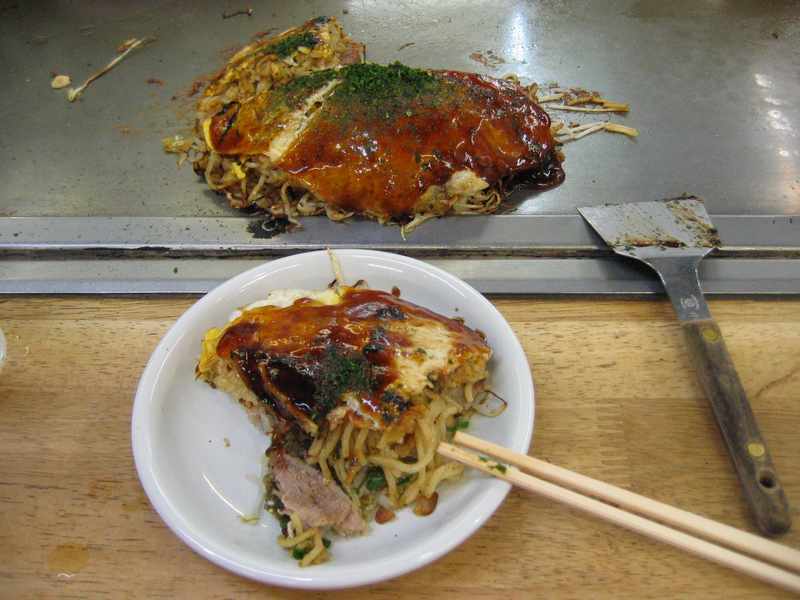 We walked into the city centre and, with guidance from the Lonely Planet, located a Hiroshima-Yaki restaurant. 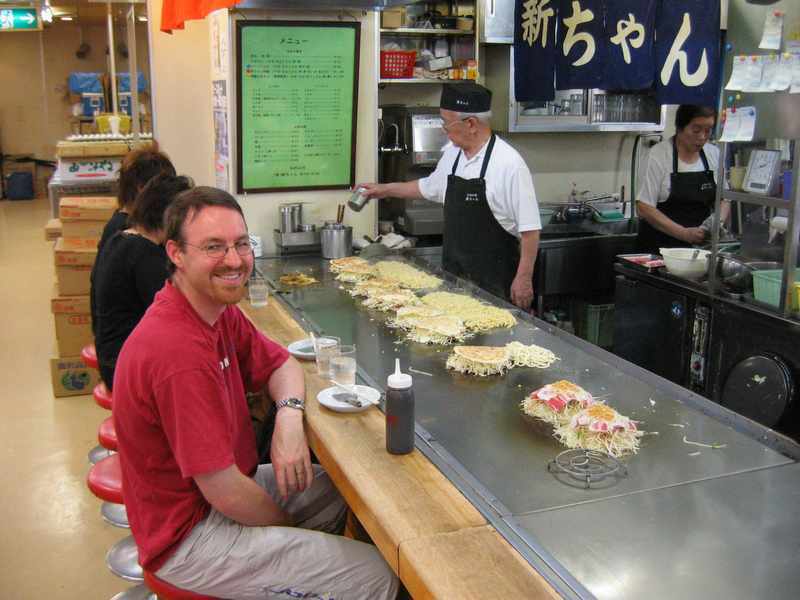 Actually, we found a building with 3 floors full of small shops all just serving exactly the same thing - Hiroshima pancake! 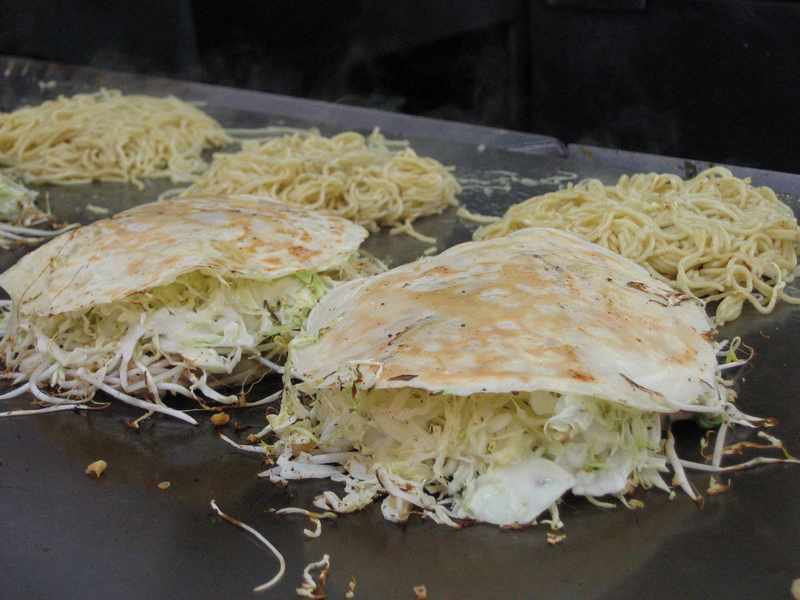 It's a local version of a dish called Okonomiyaki and is an egg-based savoury pancake made with soba (thin buckwheat) noodles. They were very filling and tasted great. The chef simply cooks them in front of you on the hotplate and moves them over to the edge of the hotplate when he's done, and of course accommodates the many different requests of customers, thus baffling the uninitiated who were merely trying to keep track of where their pancake was. Our husband/wife team looked like they'd been doing this job since the dawn of time. The chef looked almost asleep while cooking, but it all seemed to work. If memory serves, we didn't eat much that night. The pancakes contain goodies including egg and fat bacon (I detected a few bits of red meat amongst the white before it was added to the stack). Shredded seaweed and shredded squid gave it a salty and fishy flavour which was a little …interesting, but ok. It was part of the whole taste experience. 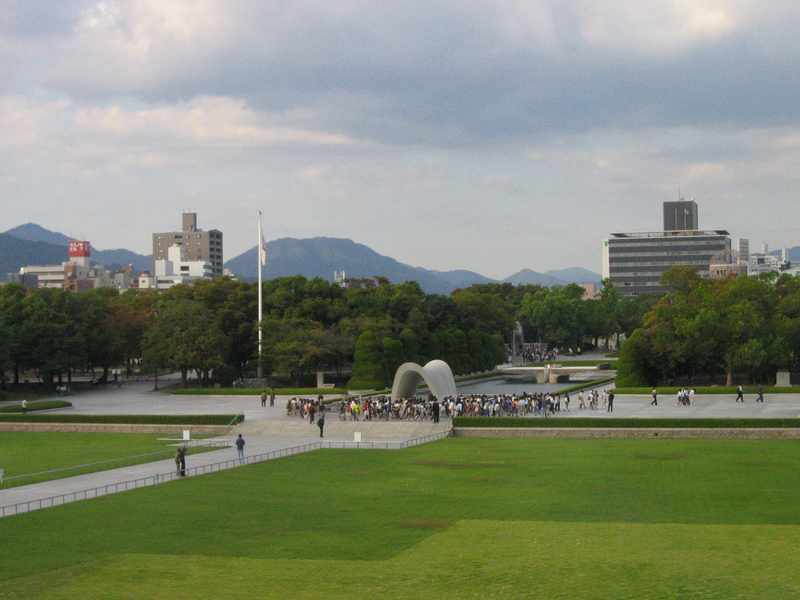 We walked in the clear air with a gorgeous midday sun down to the Peace Memorial Park, the museum & surrounds dedicated to the A-bomb dropped on Hiroshima in August 1945 (city convention refers to it as 'the A-bomb'). Out the front there was this statue of a woman protecting her child from the blast. 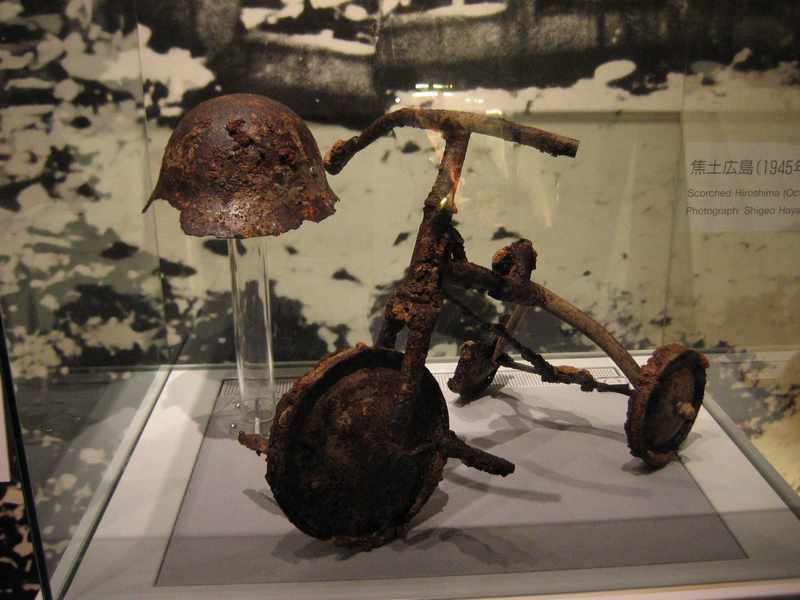 The museum had many, many displays depicting what happened on that day. 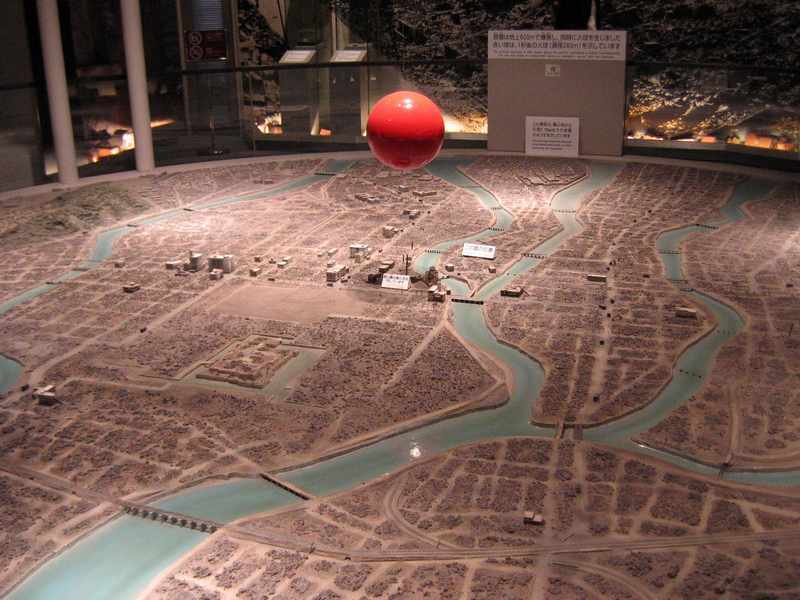 There was miniature models of Hiroshima showing before and after views of the city. There was a number of videos running explaining various aspects of the whole thing, like the construction of the bomb, the geography of the area, the people who lived there at the time and the events leading up to it being dropped. There's a whole range of artefacts that have been preserved. Some of the most interesting ones were this watch that stopped at exactly 8:15am, a small tricycle, some glass bottles that had melted together, some stone steps that still showed the outline of someone sitting on them and various items of clothing. 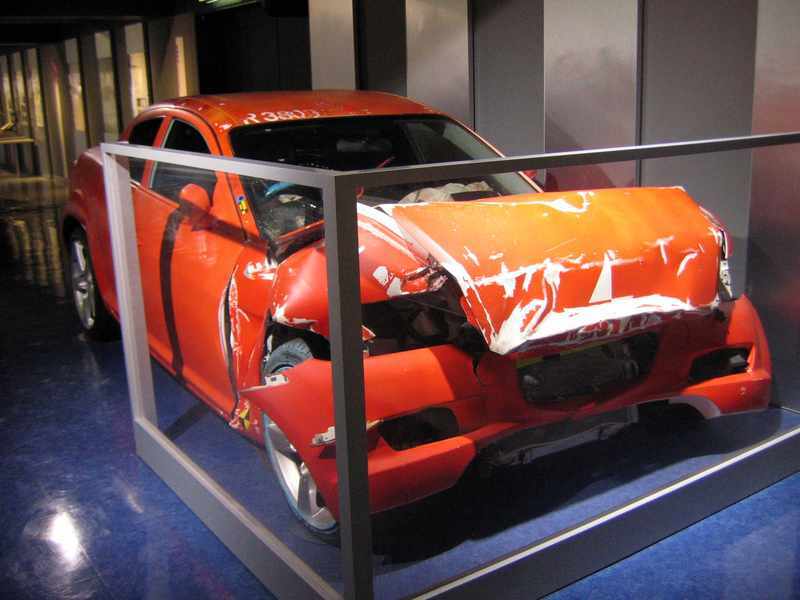 The whole museum was very emotionally geared. 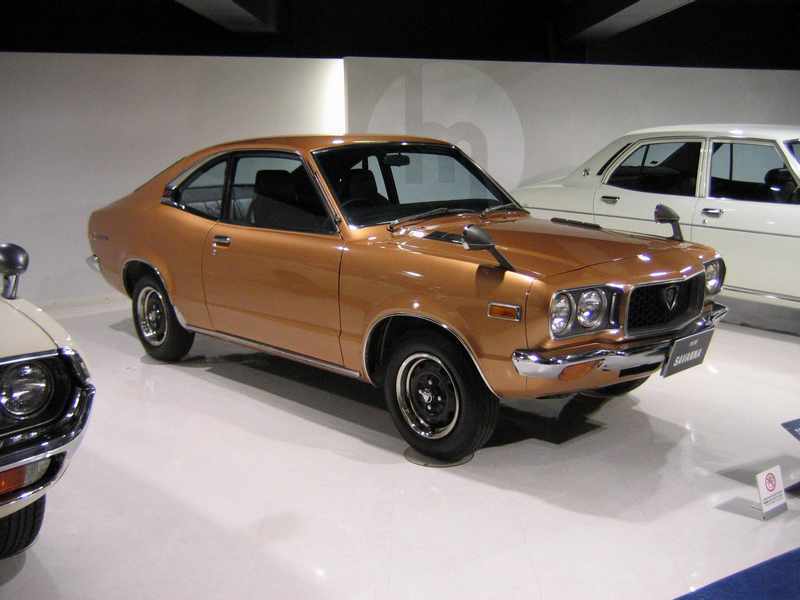 It told the story very much from the Japanese perspective. There was very graphic waxworks figures with people with dripping skin and flesh in red-light settings of crumbling rubble and chaos. 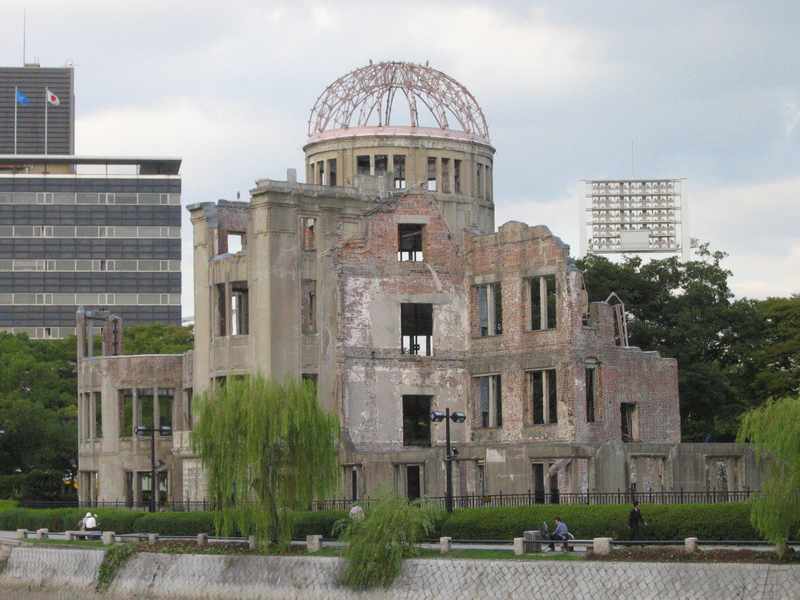 The fact that the Japanese government had twice rejected the terms of peace, the second time only a week or two before the bombing, was tucked away in a corner. The music was very sombre and depressing. Gail found it especially so. There was lots of information about WHAT happened but there was very little information about WHY it happened. Almost no historical context. This was obviously intentional, but it detracted from the experience. Having said all that, there's no getting away from the fact that what happened was utterly terrible and thousands lost their lives. 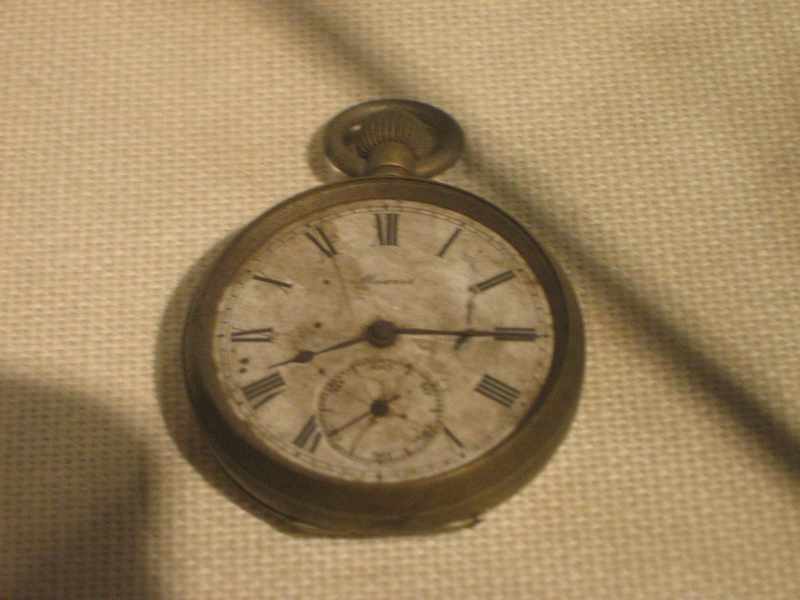 I think it would have been better to go quickly, however the nature of the bomb meant that people suffered for years and years after. 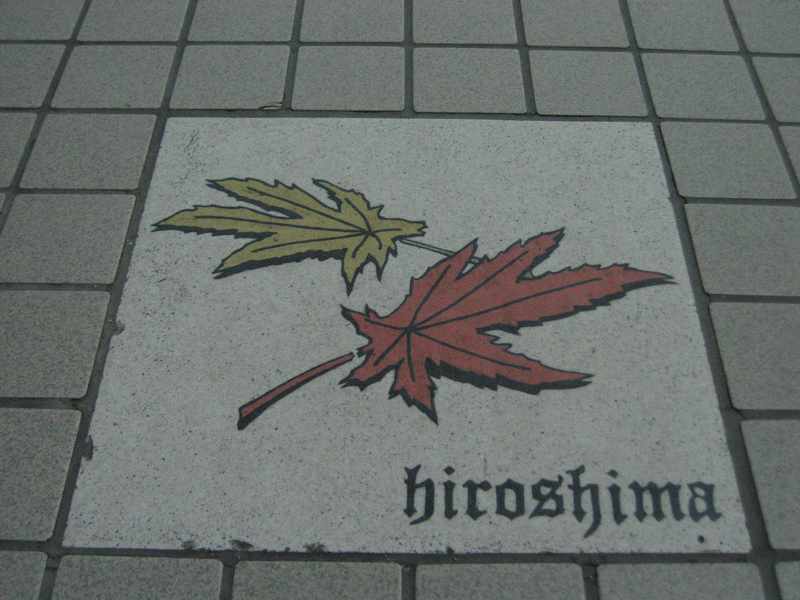 These days it seems that it's impossible to separate Hiroshima from those terrible events years ago. 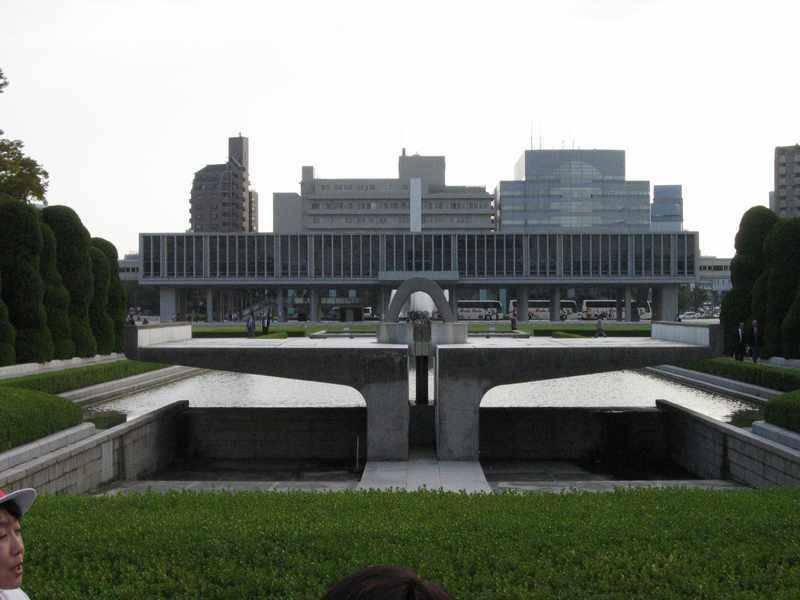 Out the front of the museum is the memorial cenotaph which burns continuously. 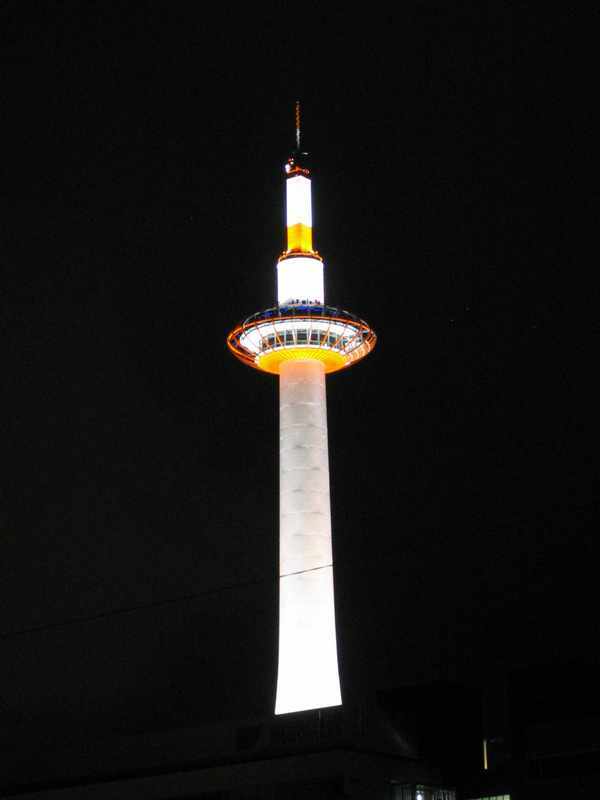 It will be extinguished when the last nuclear weapon is removed from the earth. Beyond the cenotaph lay the Korean Memorial for the thousands of Korean slaves who died in the blast. 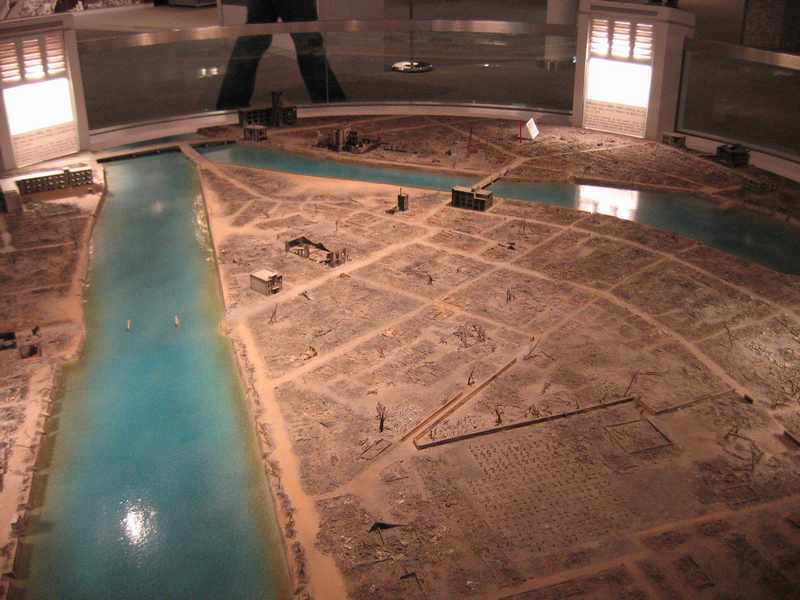 Apparently a large proportion of those in Hiroshima at the time were Chinese and Korean slaves. 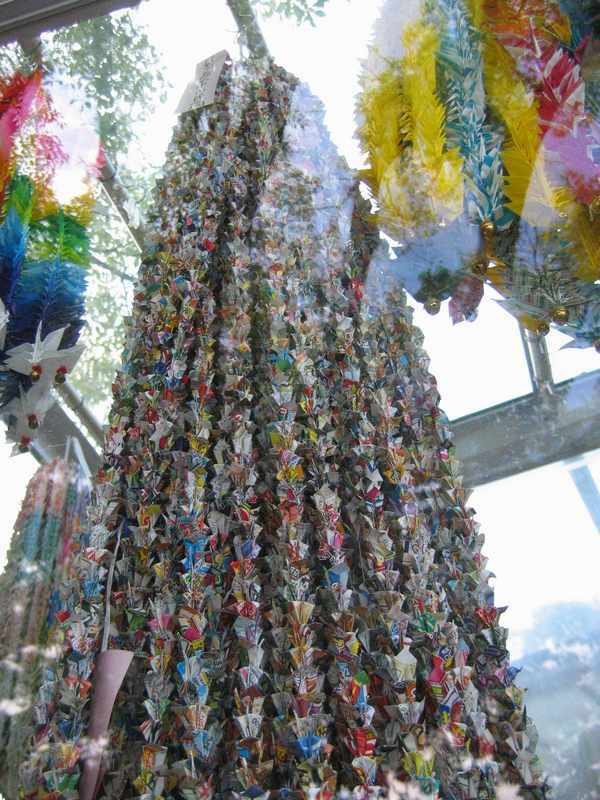 A little further along is the Children's Peace Memorial, inspired by Sadako Sazaki, the paper crane-folding girl. 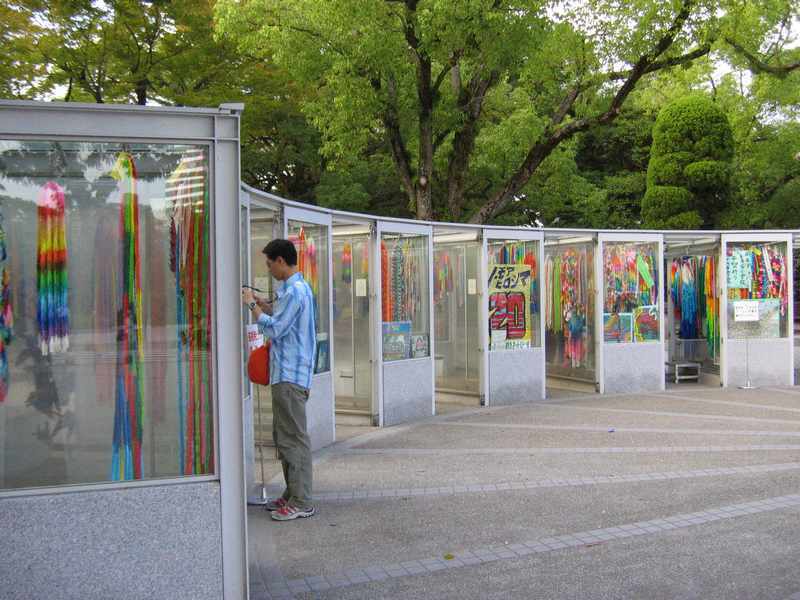 Each year children from all over Japan fold paper cranes for hanging at the memorial and they are placed in these glass display cases (BTW Gail learned a song about her in primary school, in the pentatonic scale; very lovely and moving song). 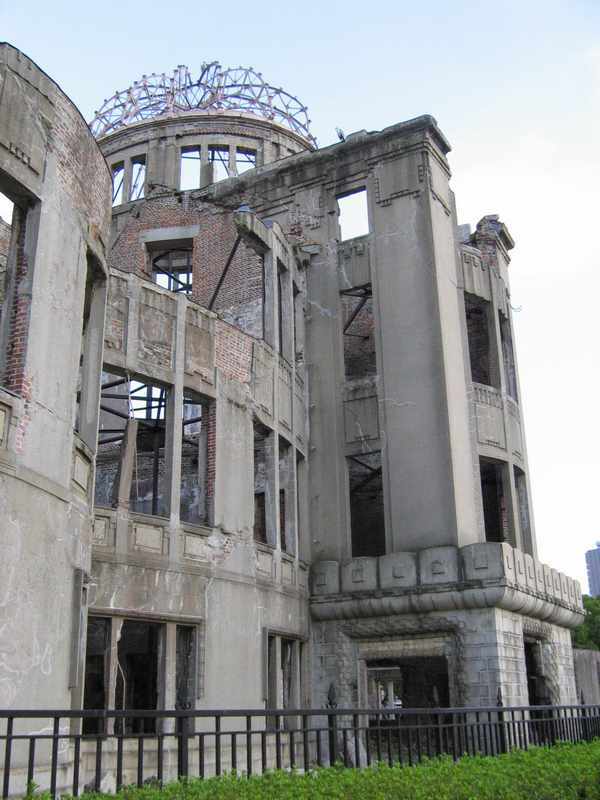 The A-bomb dome was an interesting piece of architecture. It was originally built in 1915 as a promotions hall and was designed by a Czech architect. Remarkably, it was left standing after the explosion. The bomb detonated approximately 600m above and 160m south-east of the structure. 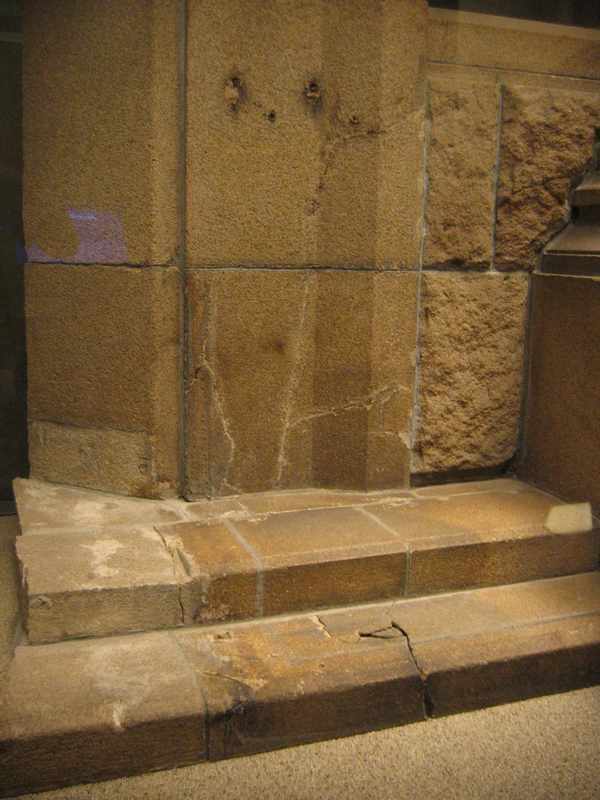 The relatively vertical direction of the blast is one of the reasons that the building survived however you can still see the slightly sideways deformation of the metal frame of the dome from the blast. The building was left derelict for many years until it was decided to preserve it as a memorial. 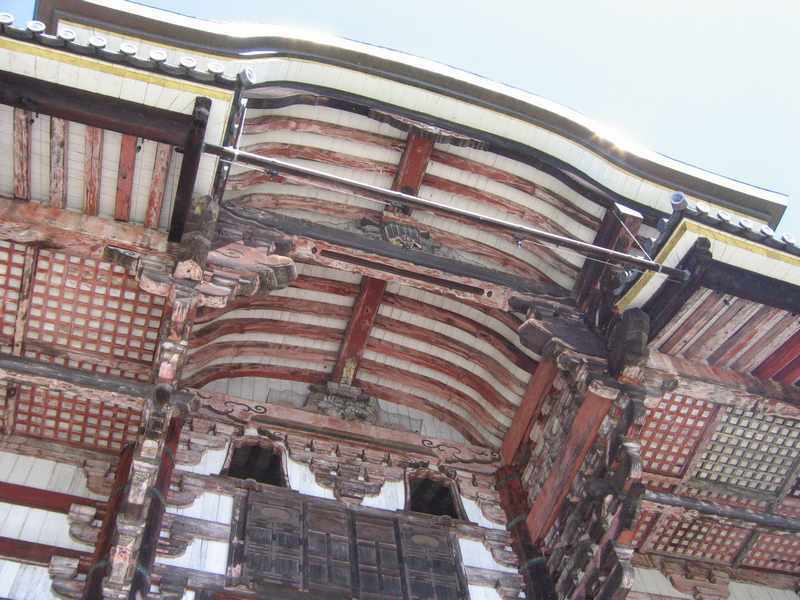 It has subsequently been internally braced and was World Heritage listed in 1996. Following on from the museum we found our way down into an Internet cafe, where for 545 yen we had 1 hour of Internet and unlimited tea/coffee/etc. It was a good opportunity to check up on mail, see what had been happening in the world during our absence and do a quick blog post. It was also a fascinating cave, where there was everything from basic desktops through to fully enclosed leather chair cubicles. 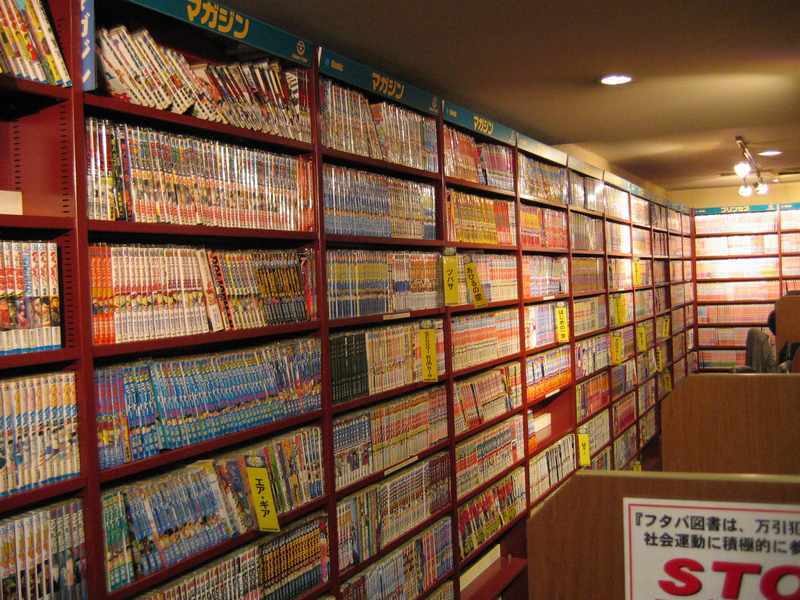 The walls of the place were lined with rows & rows of manga cartoons. The price was worth it just for the novelty of sitting in leather executive seats, and making your own caffeine concoctions, hot chocolate and sampling a few herbal teas and even a (highly processed) corn soup. 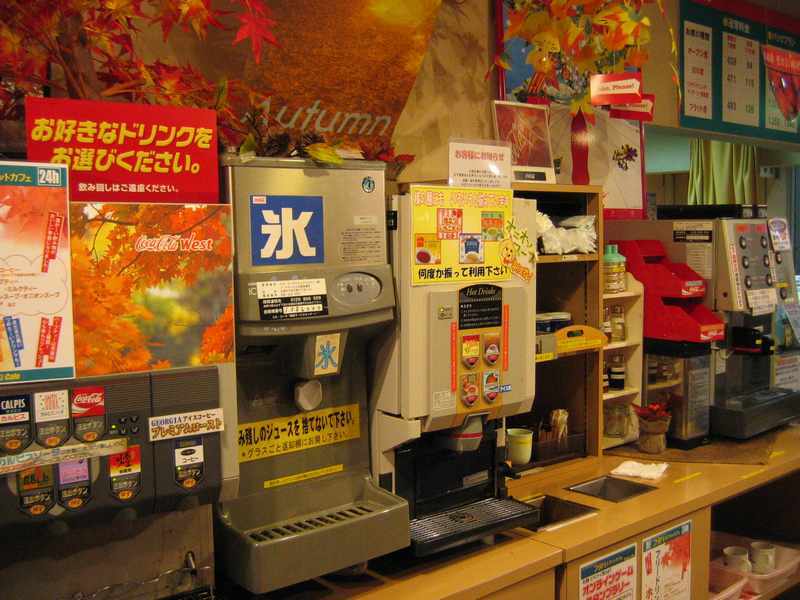 We found a small cafe to settle down in for dinner, as we took the walk back to our Ryokan. 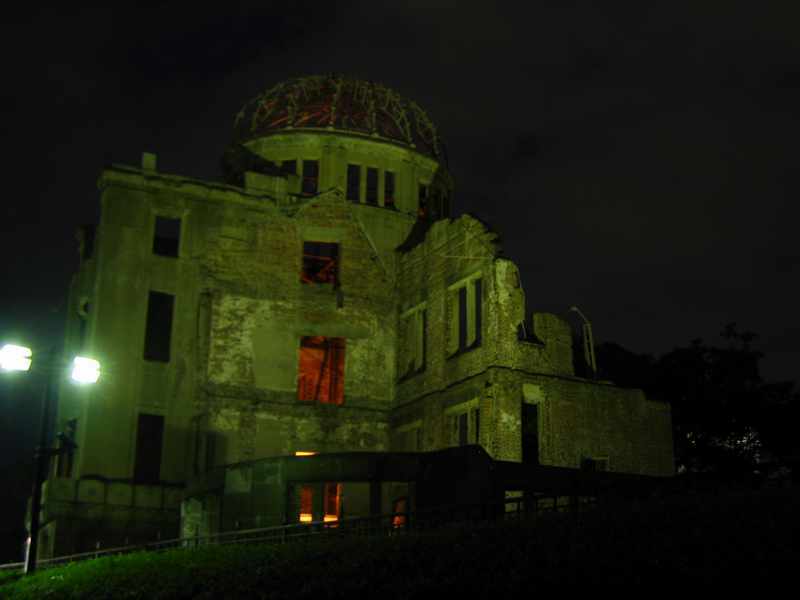 Once again Hiroshima was showing itself to be consistent with other parts of Japan by presenting an air of safety and security, even in the cool of the evening. 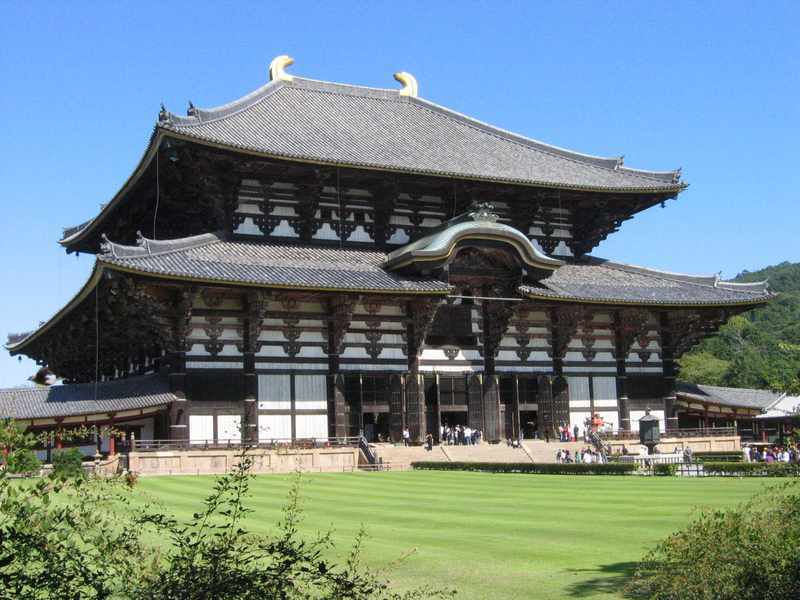 Our next day in Japan was a day trip to Nara and it was one of our best days in Japan. 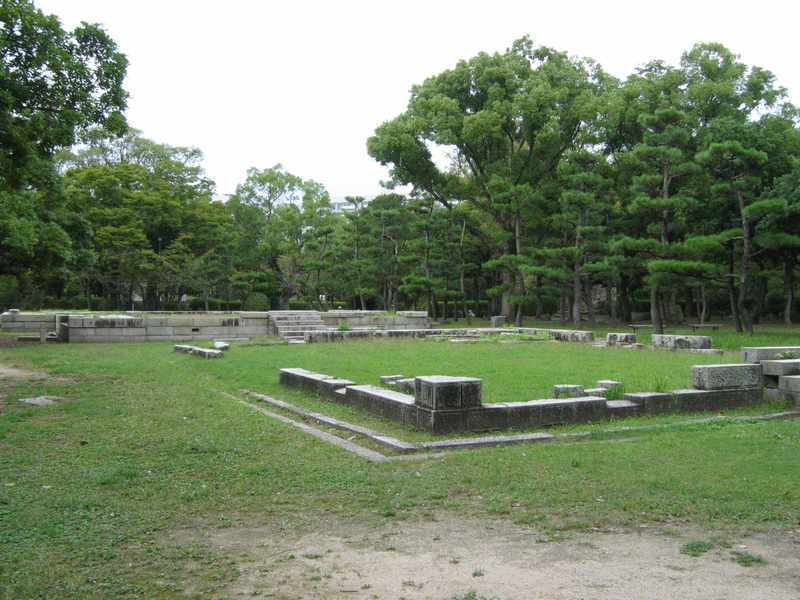 Nara was the capital of Japan from 710 to 785 AD. 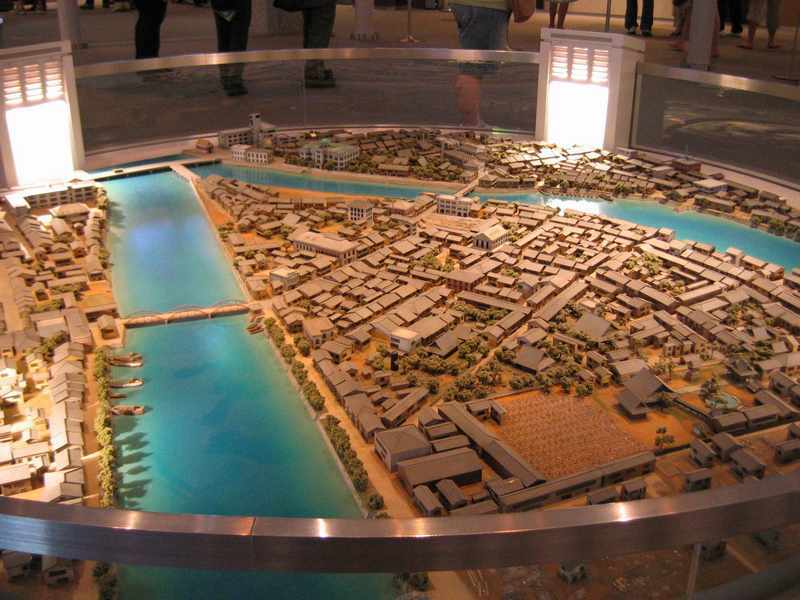 The capital was moved to Kyoto in 785 and it remained so up until 1868. At just under 1 hour on the JR train from Kyoto, it's 363,000 people and 8 UN World Heritage listed sites can be done in a couple of days, however we packed the most interesting bits of it into a single day. 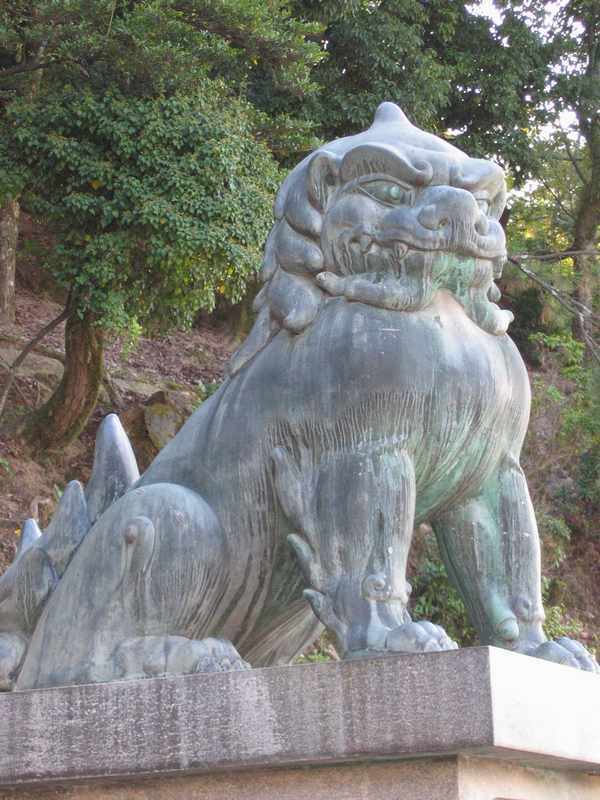 The city itself (a mere country town by Japanese standards) was relatively uninteresting on first acquaintance but in and around the town, particularly in the foothills, lay some real hidden beauties. The touristy quiet main street gave way to some wonderfully picturesque trees and rolling hills with all kinds of historical monuments nestled within. I'm glad we had a clear sunny day because lots of the sites require lots of walking and it would be particularly unpleasant in inclement weather. 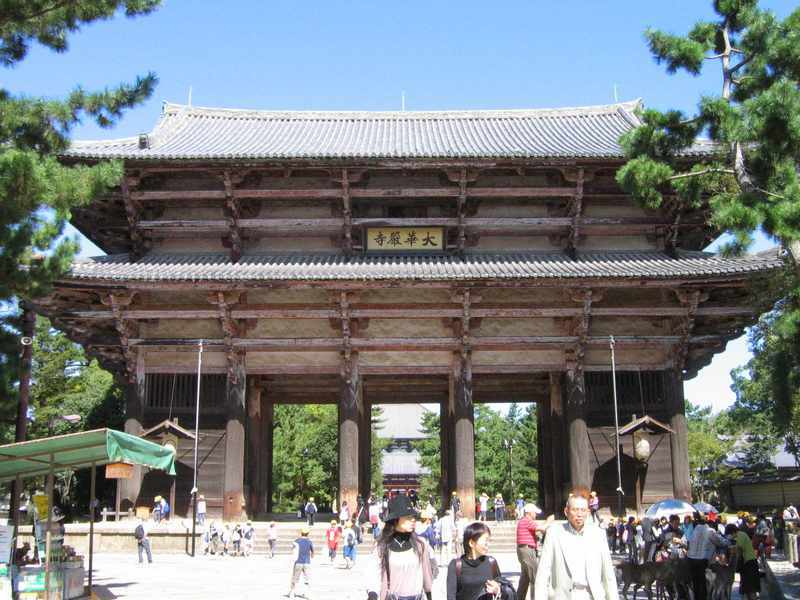 We walked through the town and headed left towards Nara's star attraction, the Todai-Ji* temple. 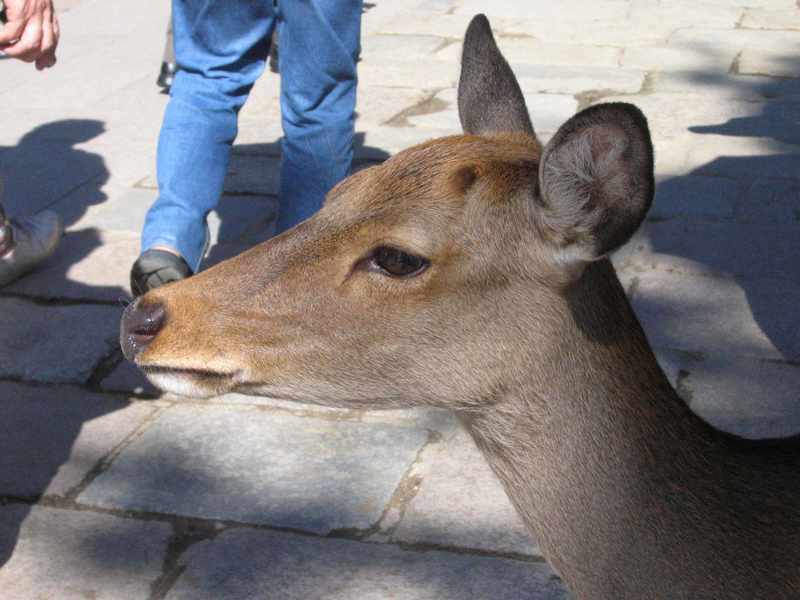 We approached the temple down a lovely leafy road where we were approached by the "man eating deer" who seemed to help themselves to inspecting the hands of all visitors in the hope of a tasty treat. 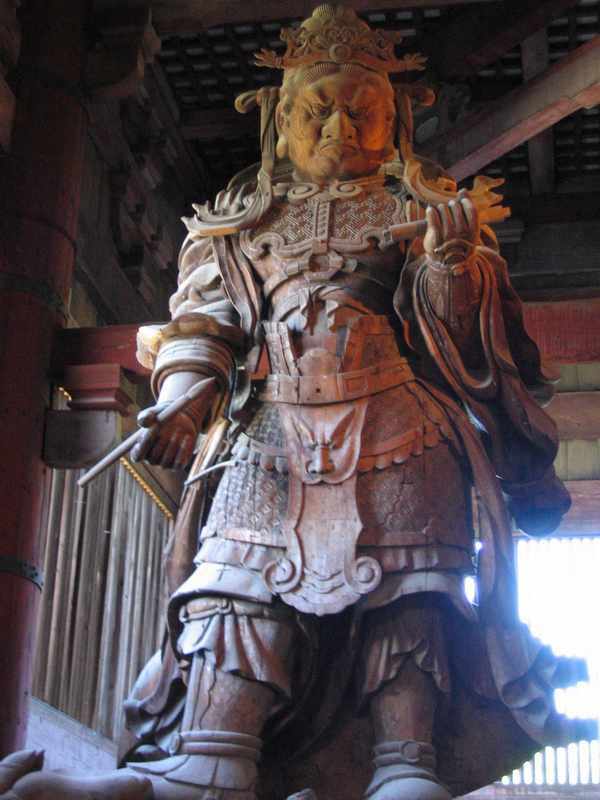 The great Nandai-mon gate is at the front of the temple and under it's roof are two fierce-looking Nio guardians. They were carved from wood in the 13th century and were magnificent works of art, seeming ready to spring to life at any moment. The Todai-Ji temple was truly magnificent. The picturesque setting and clear blue sky helped with the impression, I'm sure. 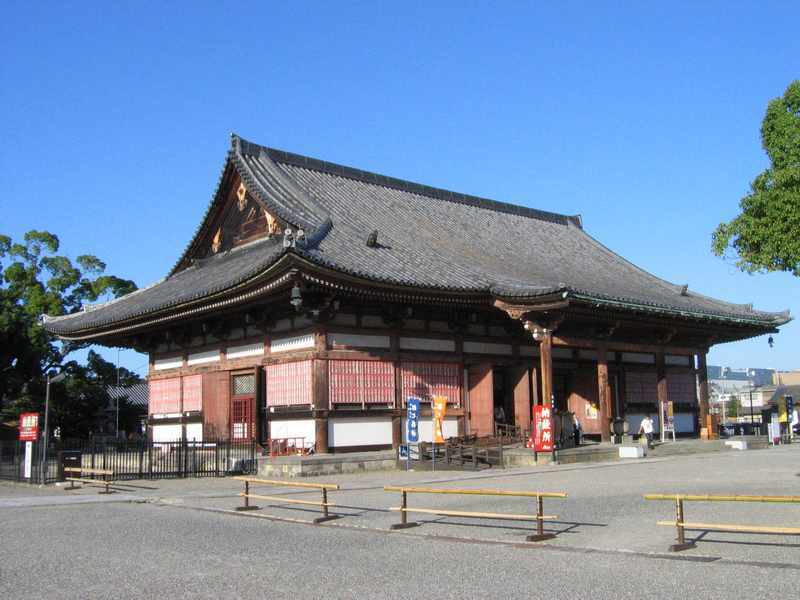 The present structure was built in 1709 and, despite being 2/3 original size, is still the largest wooden structure in the world. 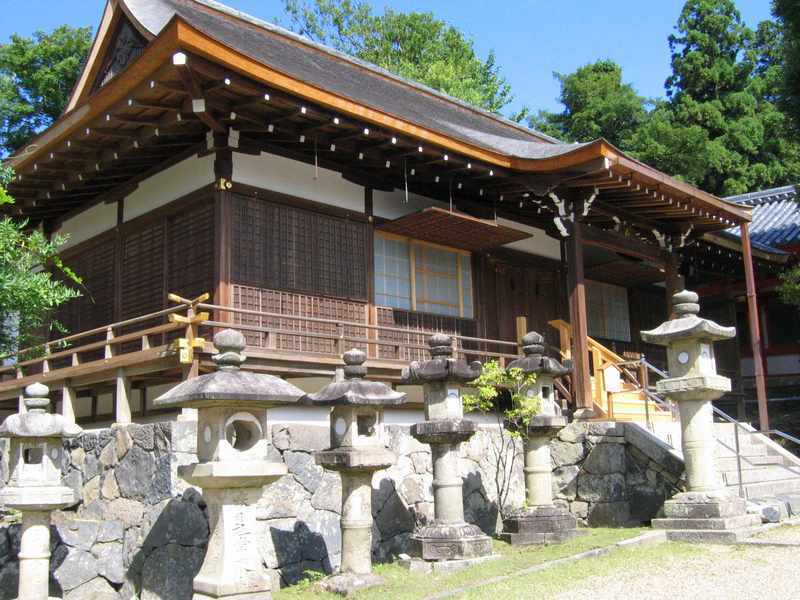 Like most of Japan's religious buildings, it's been burnt down a few times. The original pagodas that flanked the main temple on either side have never been rebuilt. 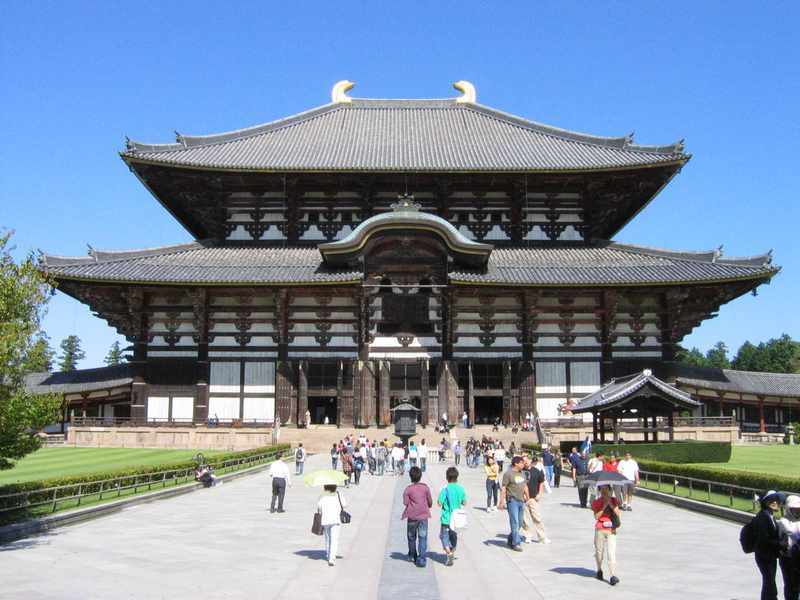 Inside it housed one of the largest bronze Buddha statues in the world and the largest in Japan. 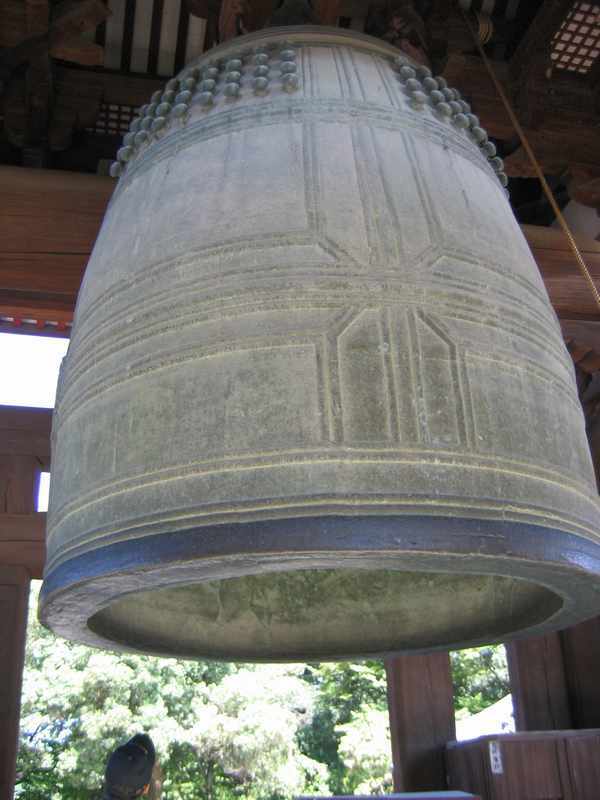 It was originally cast in 746 AD from 437 tonnes of bronze and plated in 130kg of gold. He'd lost his head a couple of times during the centuries and you could see the colour difference between the head and the torso. It reminded me of what happened to Dagon, the Ashdod god. 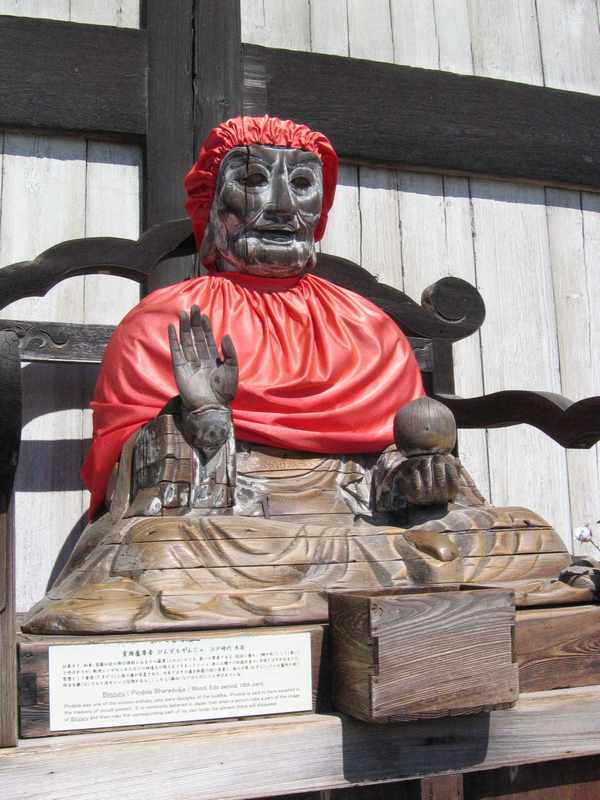 Out the front there was this wooden statue of a Buddhist priest who is worshipped. Apparently he starved himself to death in the pursuit of enlightenment. I'm sure he'll eat better next time. 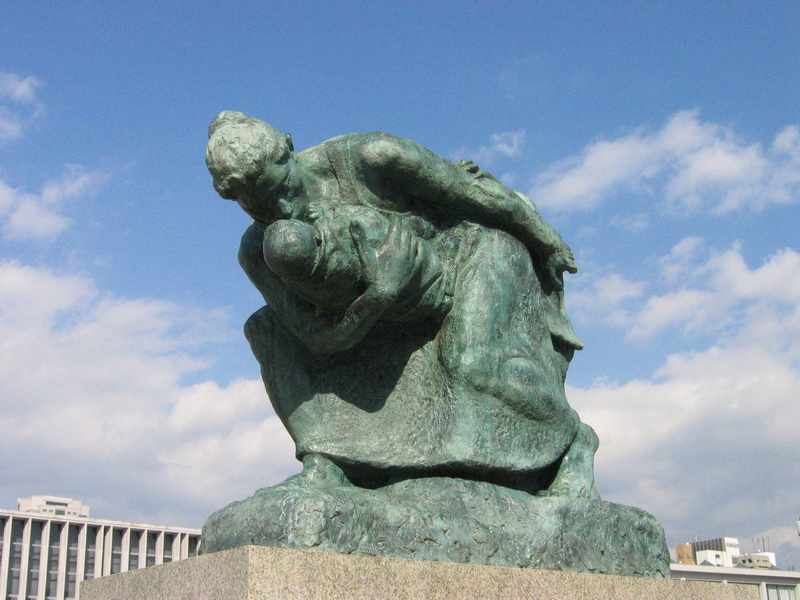 Close inspection of his statue suggested that a few wood borers clearly hadn't been paying attention in class. We headed up the hill to the Shoro belfry and this huge bronze bell. In the bottom of the photo is a head looking up at it, which gives you some idea as to it's size. 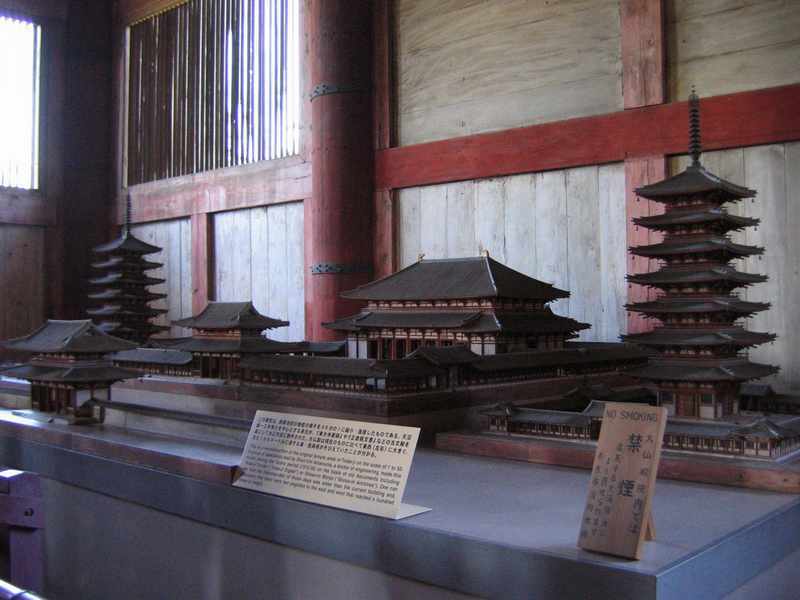 The buildings around it were used to house imperial treasures. 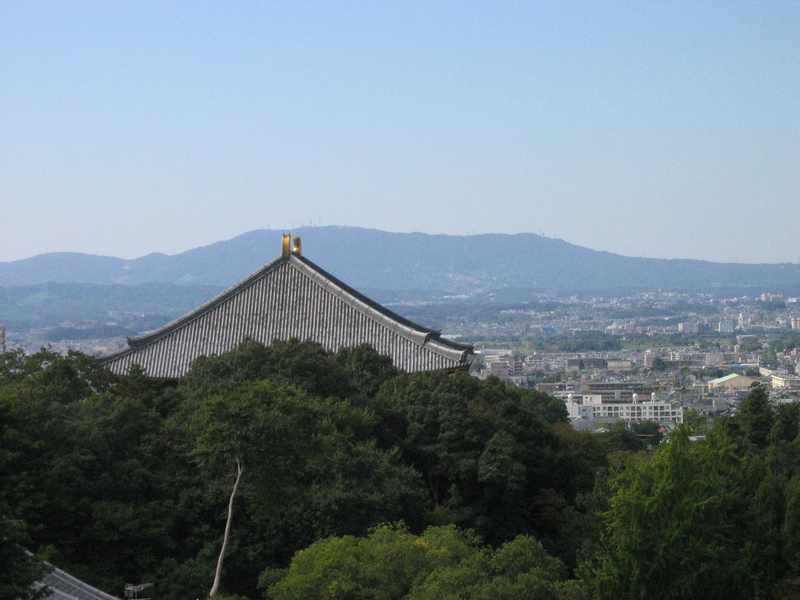 Further up the hill was Nigatsu-do which gave us a glorious view over Nara from it's 13th century wooden structure. Close by was Sangatsu-do which is the oldest structure in this part of Nara. 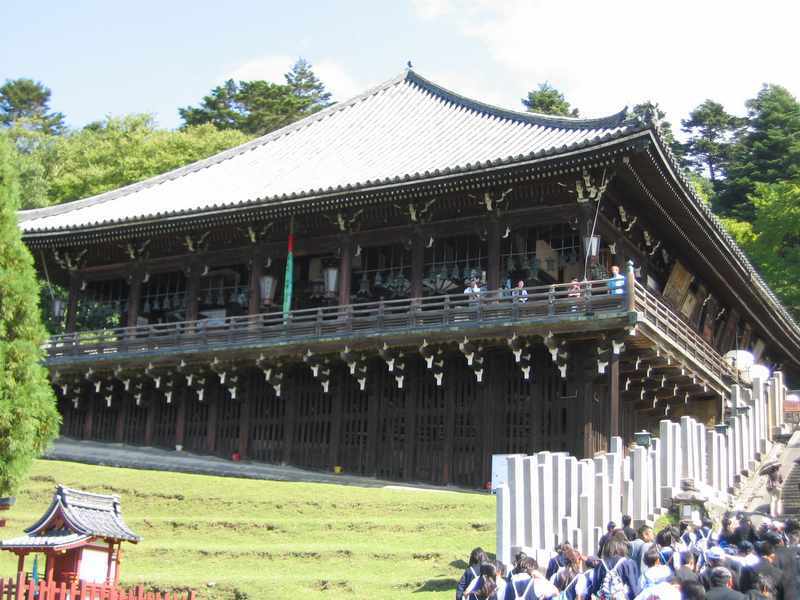 We wandered along the face of the hills, through the trees, enjoying the day, until we came to the Kasuga-Taisha* complex. 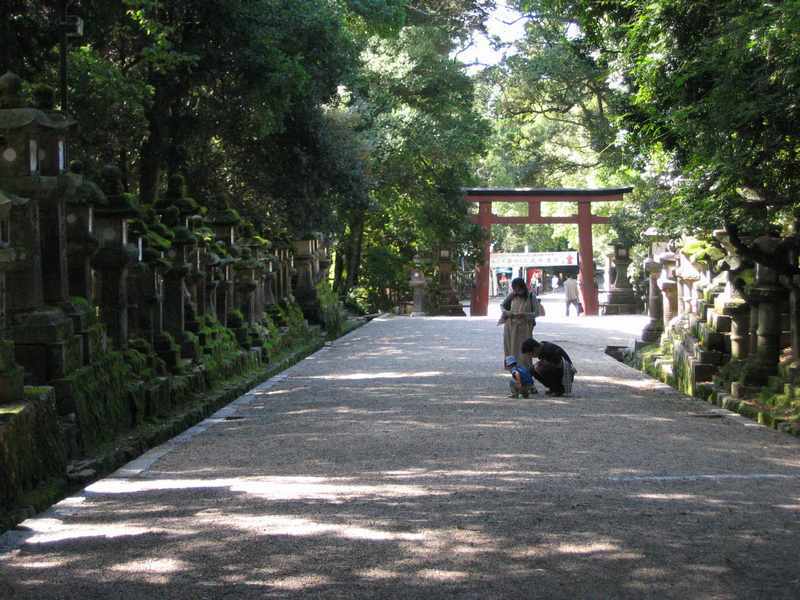 The paths here were all tree lined and, in some cases, stone lantern lined. 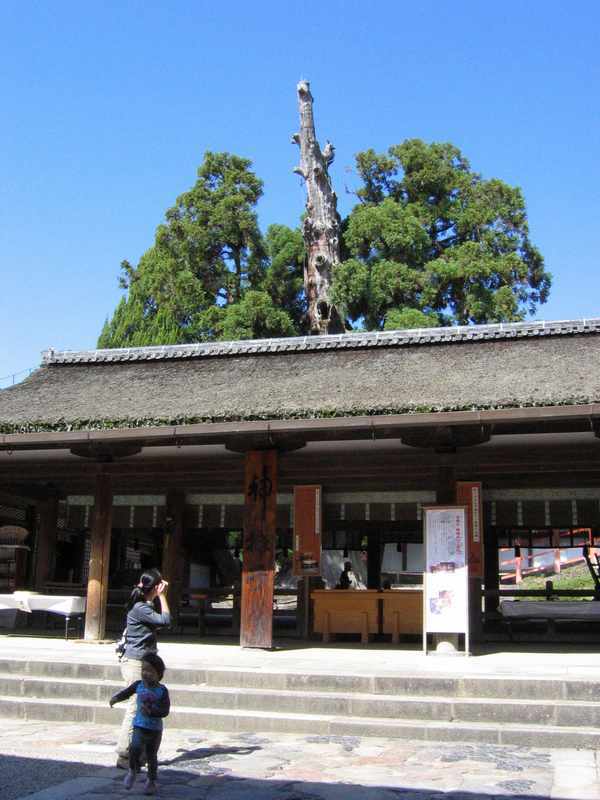 Here in Kasuga-Taisha there was a famous old tree, valuable enough to be protected by it's own lightning rod. 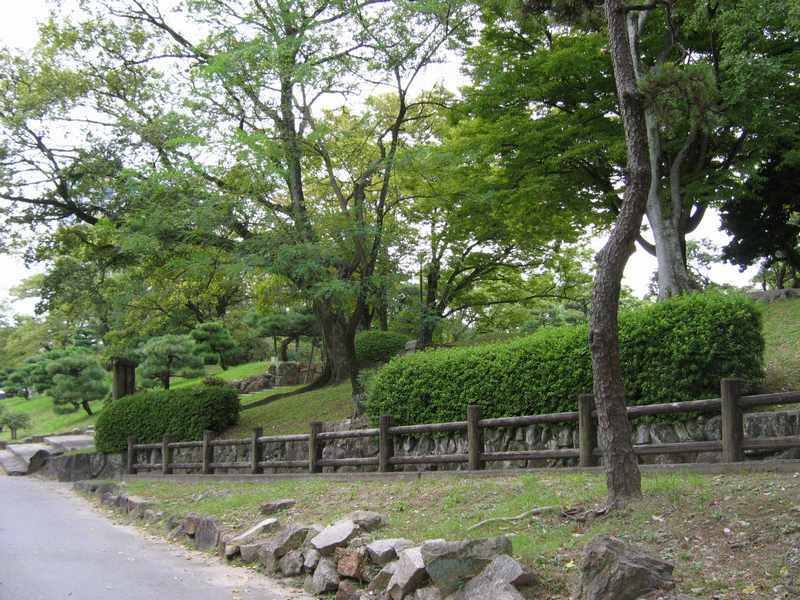 We grabbed an ice cream from one of the many vendors and strolled down the wood-lined lane back into Nara. 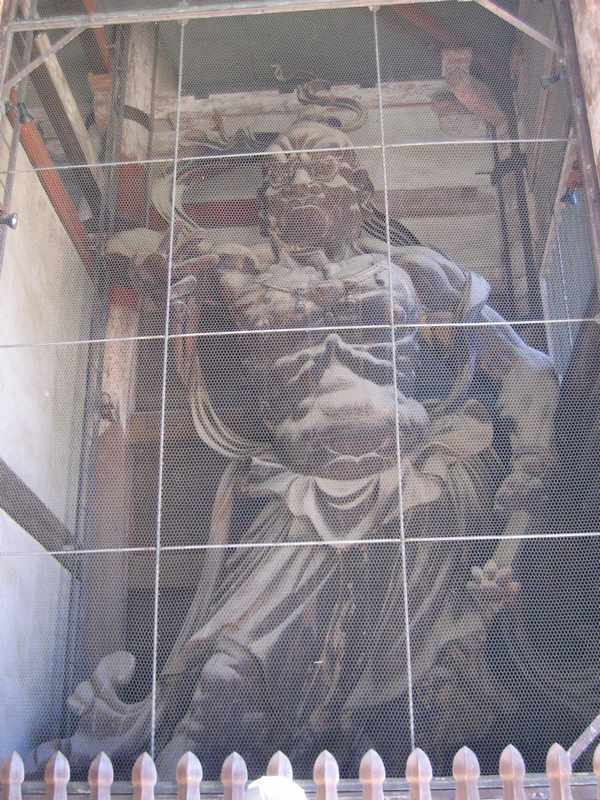 Back in Nara we visited the Kofuku-Ji* temple. 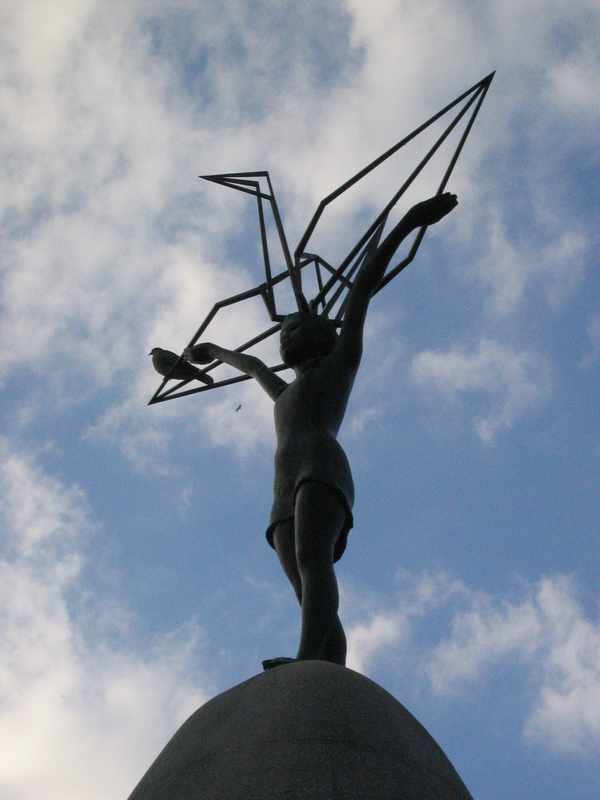 IT was moved to Nara in 710 when Nara became the capital. Various fires, power struggles and time has left only a dozen of the original 175 buildings still standing. 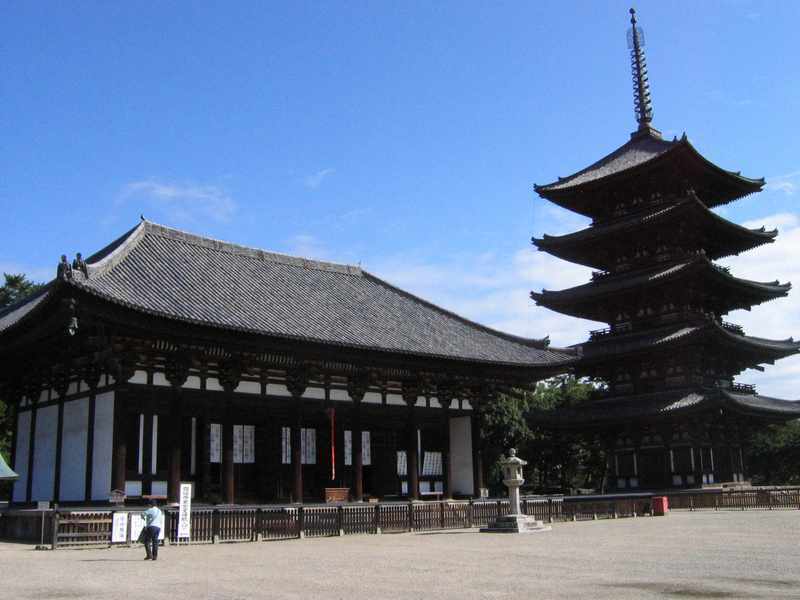 There were 2 pagodas here, a 3 storey and a 5 storey one, dating from 1143 and 1426 respectively. 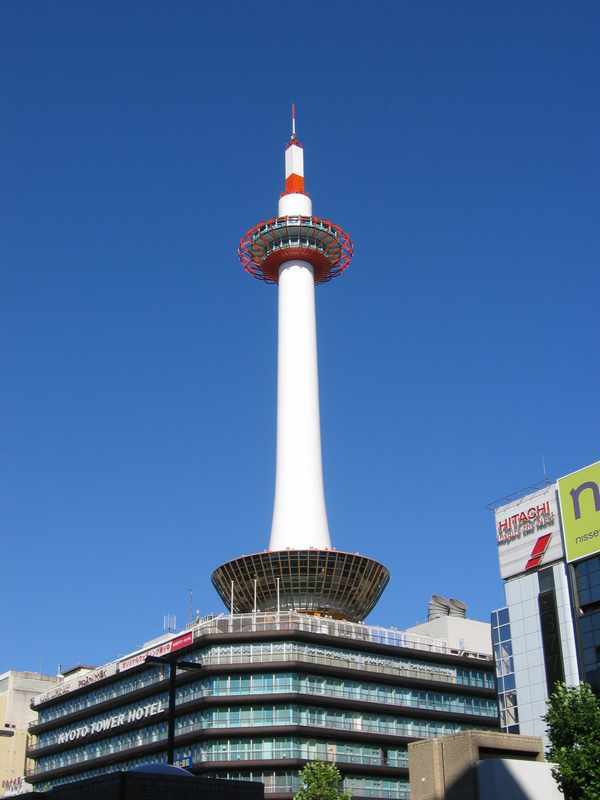 The 5 storey one is the second tallest in Japan, shaded by Kyoto's To-Ji by mere centimetres. 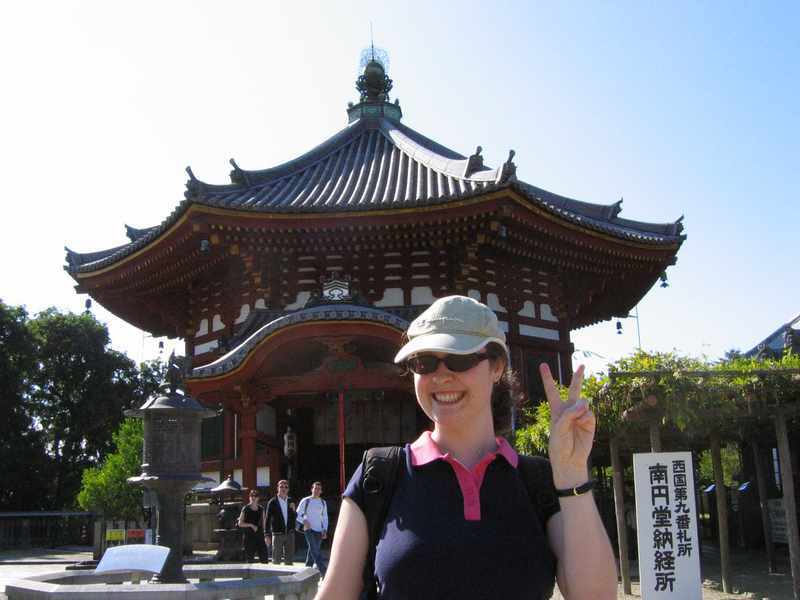 Gail also took the opportunity to get into the Japanese spirit of posing for photographs. We took the JR train back to Kyoto and, since it was nearby, walked the 20 minutes to the To-Ji temple. 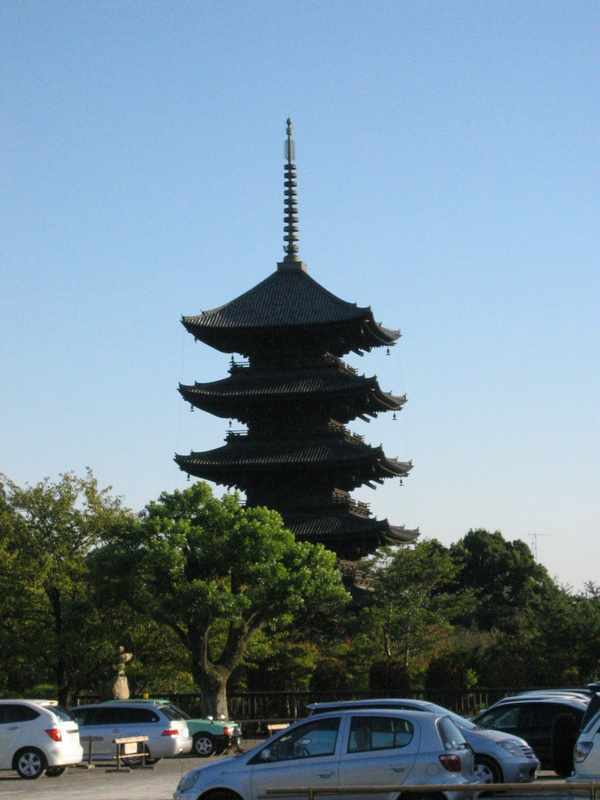 The pagoda was 57m high and had been burnt down 5 times, most recently in the 17th century. We grabbed a sushi dinner and headed back to our Ryokan. Lo and behold but my mobile phone had been deliverd. Nice! All I had to do was hand over 890 Yen to the Ryokan owner and my phone was returned. 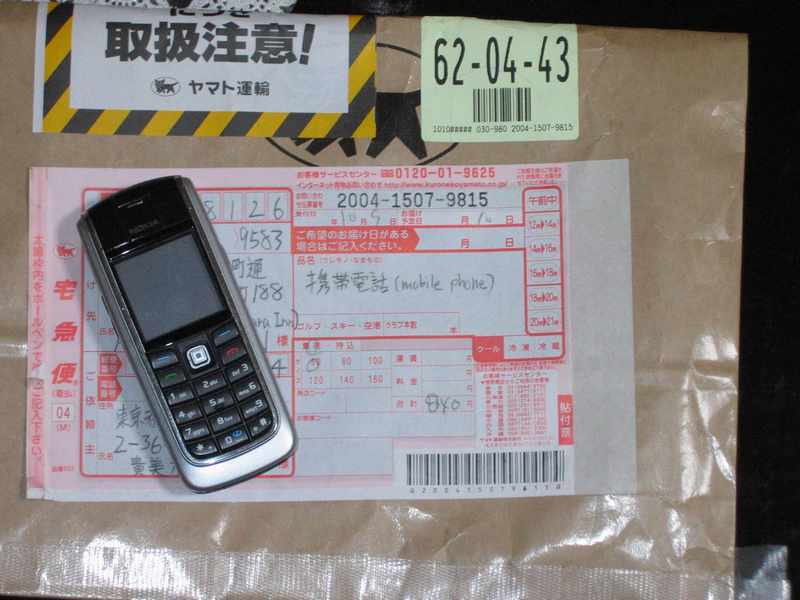 That was simply amazing service from the Ryokan owners at either end and the Japanese postal system. I was very thankful. After a day where we walked many kilometres we each had ourselves a hot bath to soothe our aching muscles. Feet, calves, thights, stomach muscles and necks all ached. We were both feeling a bit templed and shrined out, but that was to be expected. We didn't so much go to bed that night as collapse onto our futons.